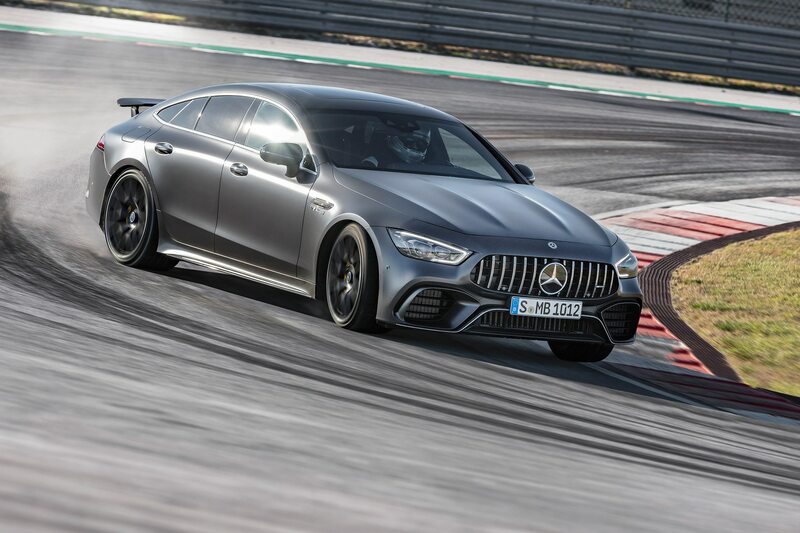 The new Mercedes-AMG GT 4-Door Coupe may be based on the third-generation CLS-Class, but it is also one of 60 bespoke AMG models and a nonconformist piece of kit altogether. 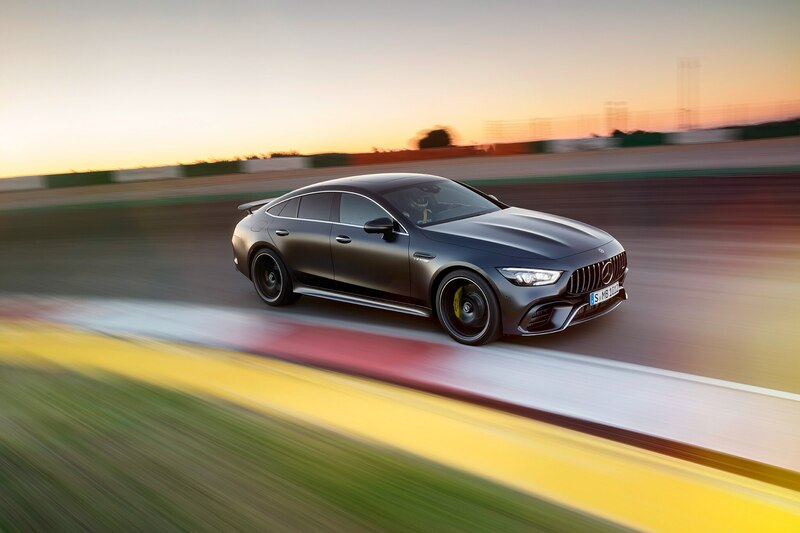 Three variants of the four-door AMG GT will be offered at launch, all equipped with the nine-speed Speedshift multi-clutch automatic, starting with the six-cylinder GT 53. 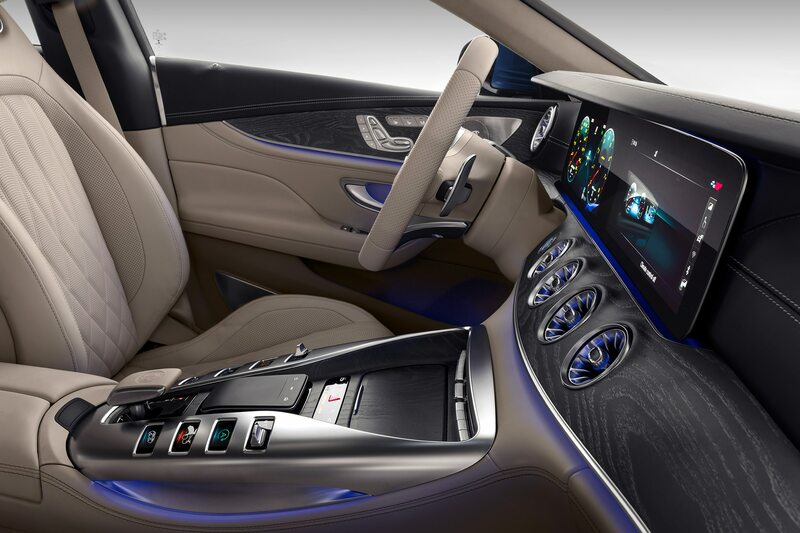 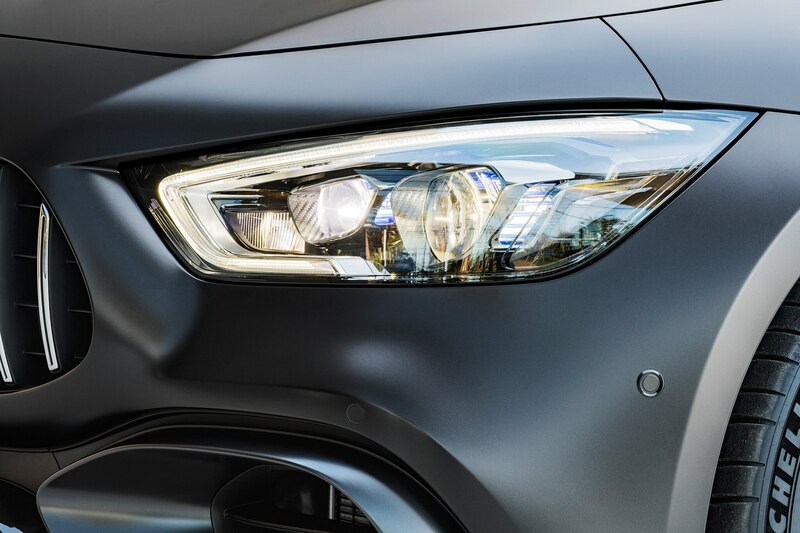 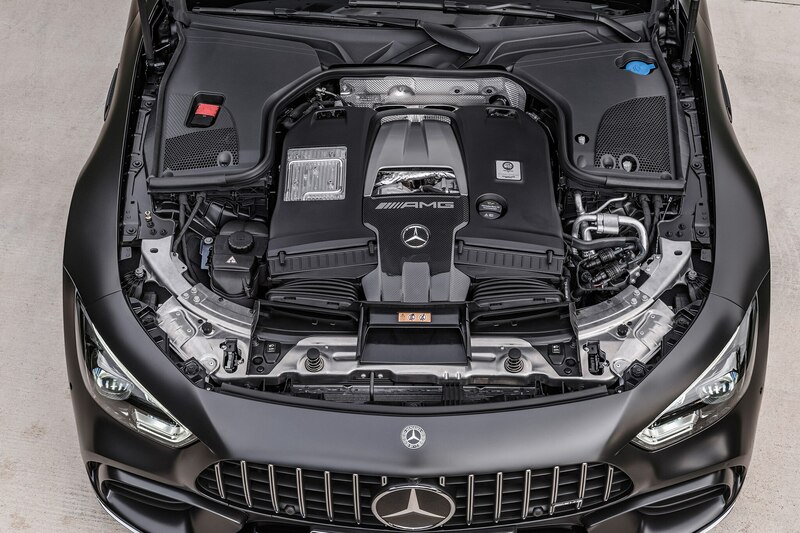 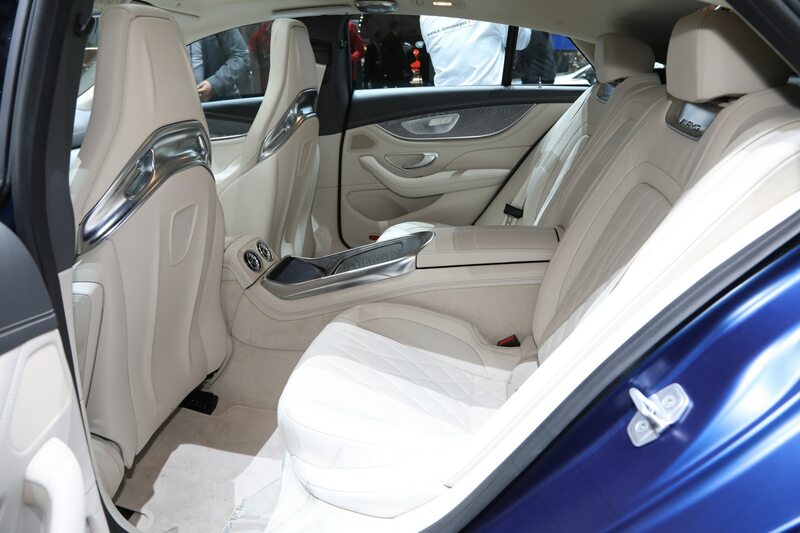 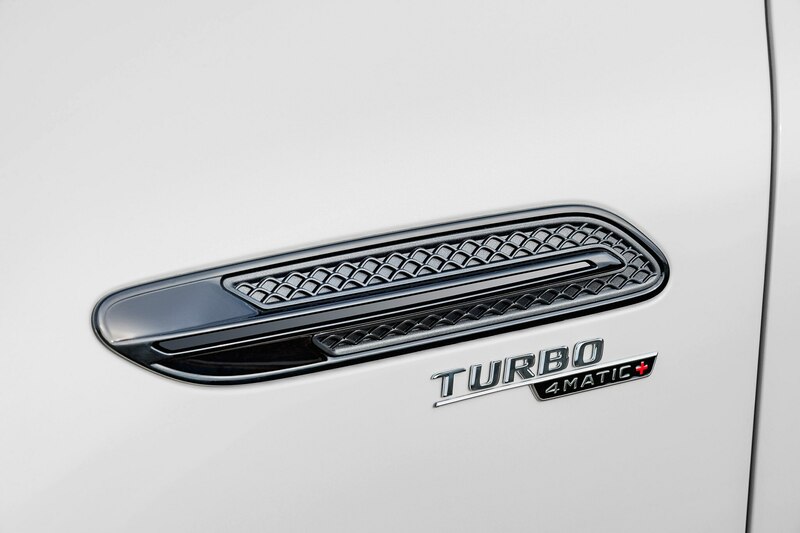 It is powered by Mercedes’ new 3.0-liter turbocharged inline-six, rated at 429 hp and 384 lb-ft of torque, not counting the 21 hp and 184 lb-ft of torque added on demand by the EQ Boost 48-volt hybrid assist system. 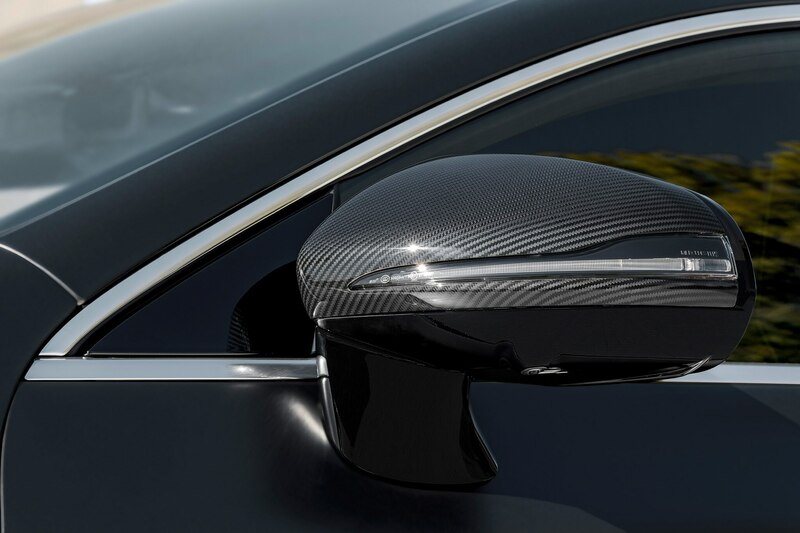 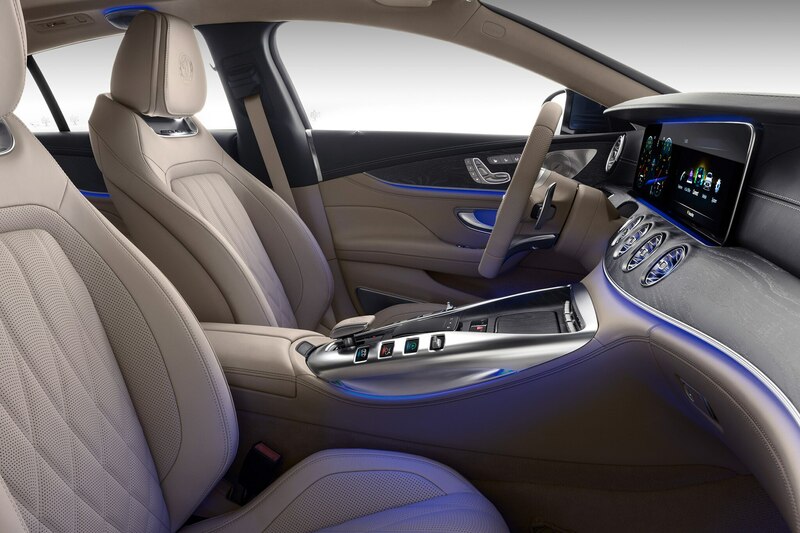 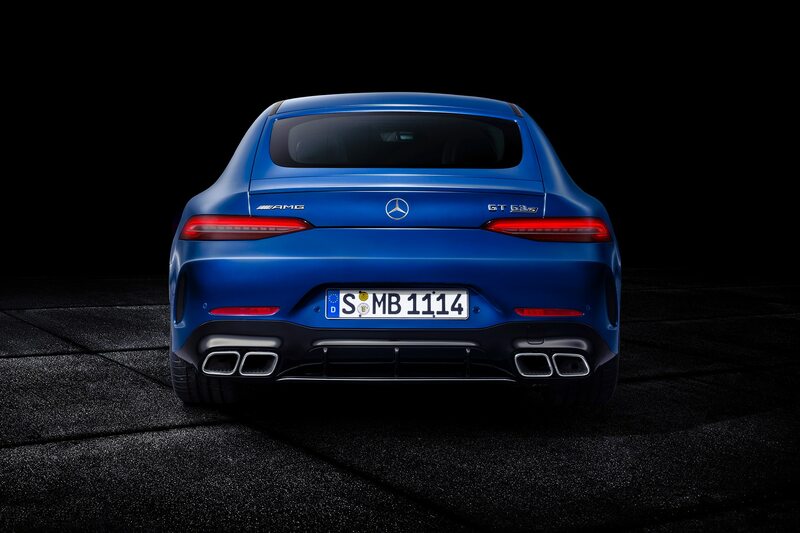 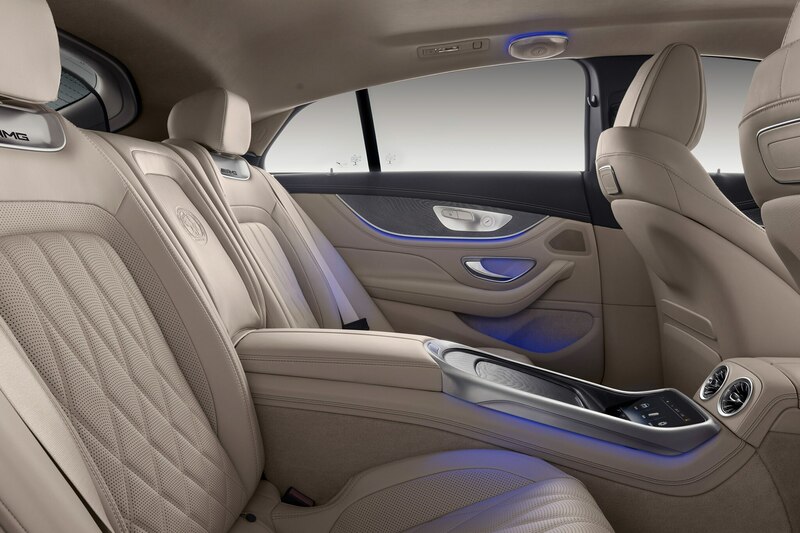 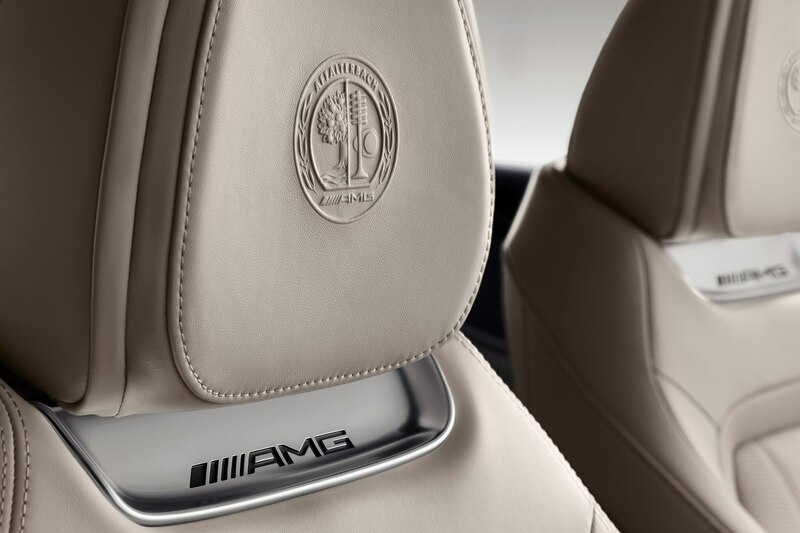 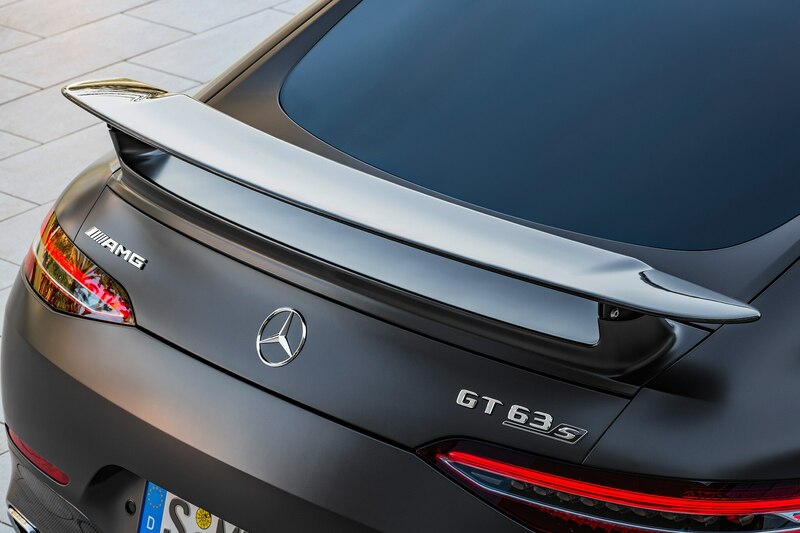 AMG claims a 0-60 mph time of 4.4 seconds and a 174 mph top speed. 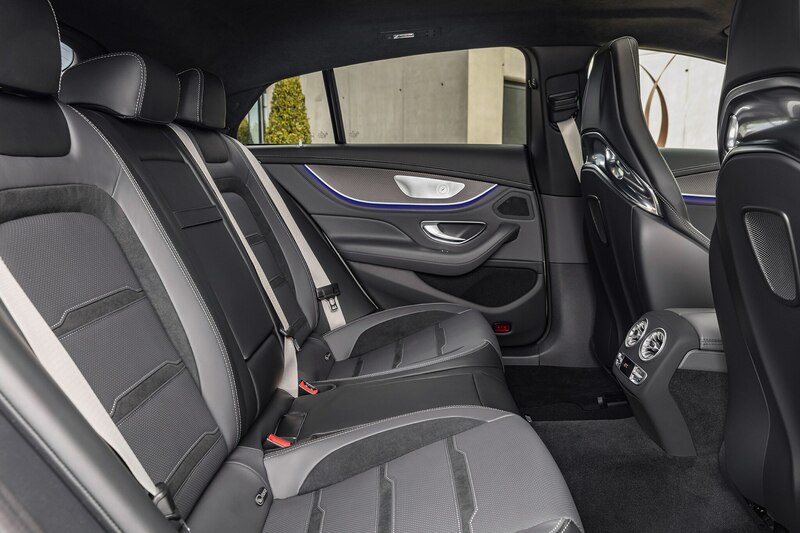 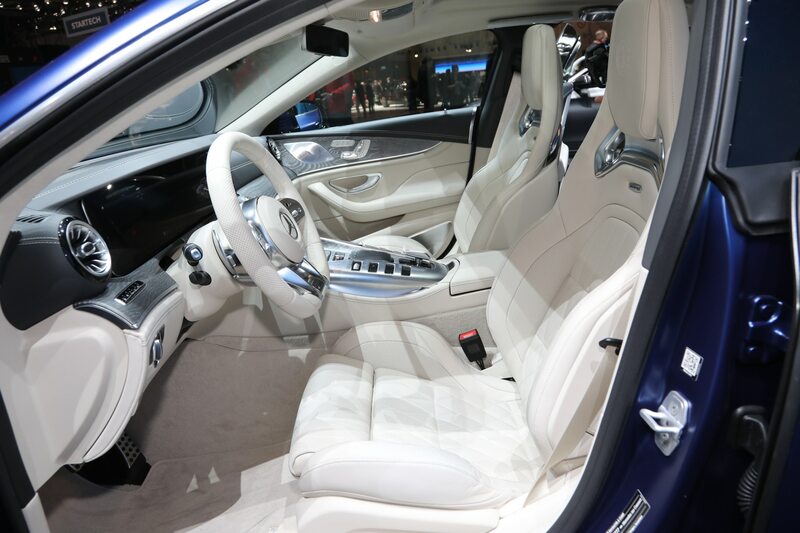 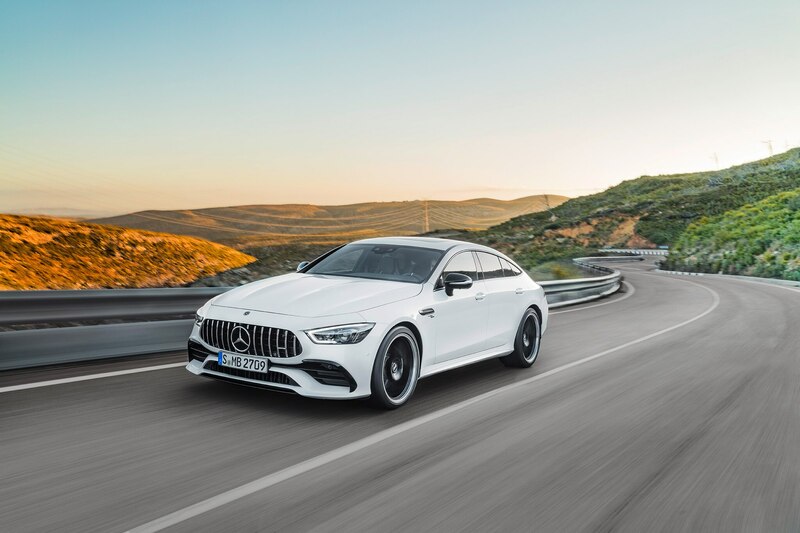 Should the market want it or legislation command it, Mercedes can relatively quickly pull a 3.0-liter plug-in hybrid model out of the bag. 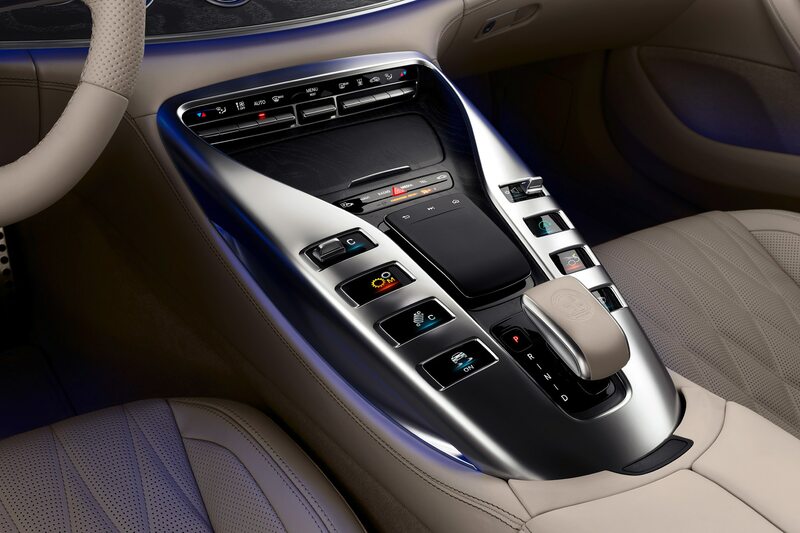 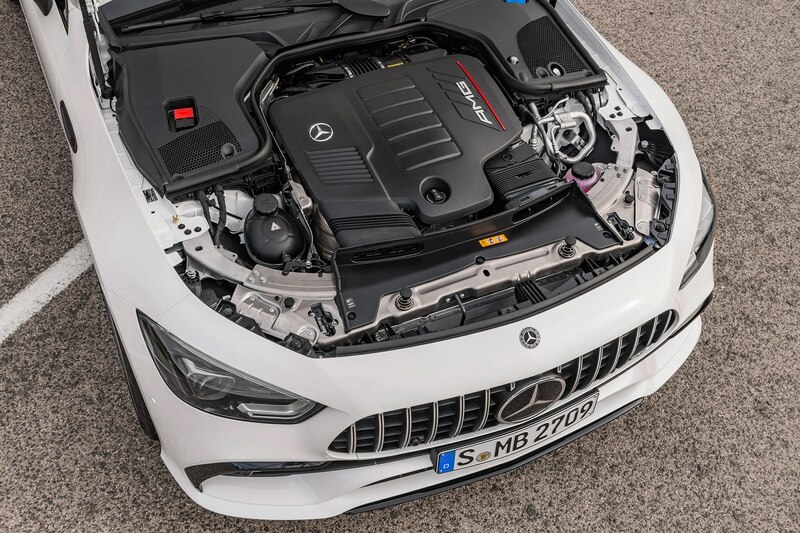 This configuration combines the 429-hp inline six with the aforementioned 48-volt hybrid system and an electric power module which adds 201 hp to the tally. 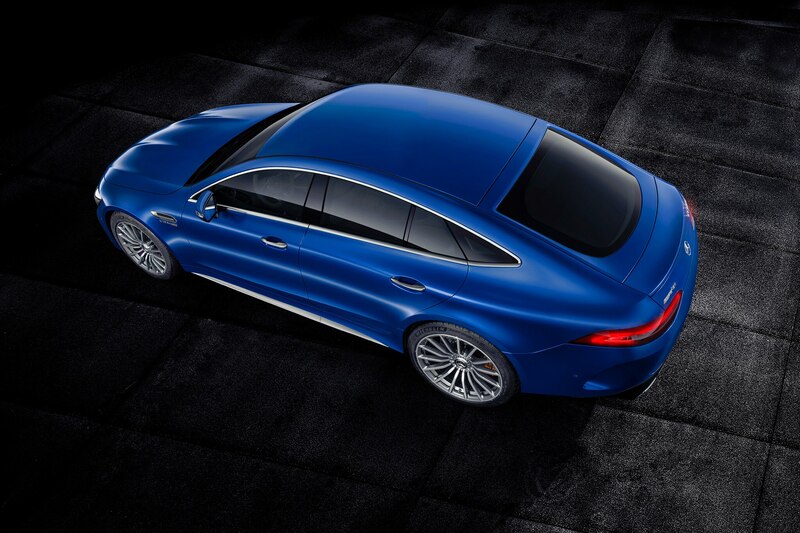 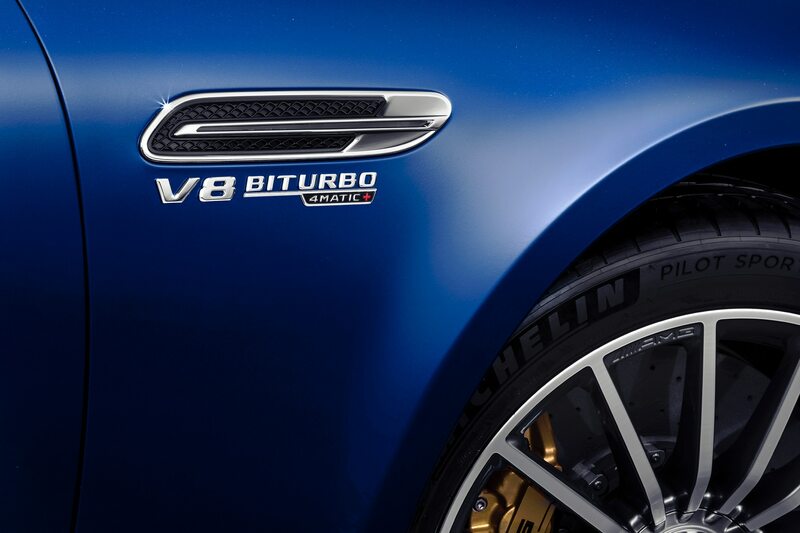 In total, that’s over 600 hp and over 660 lb-ft of torque, not to mention a highly useful electric-only range of 60 miles. 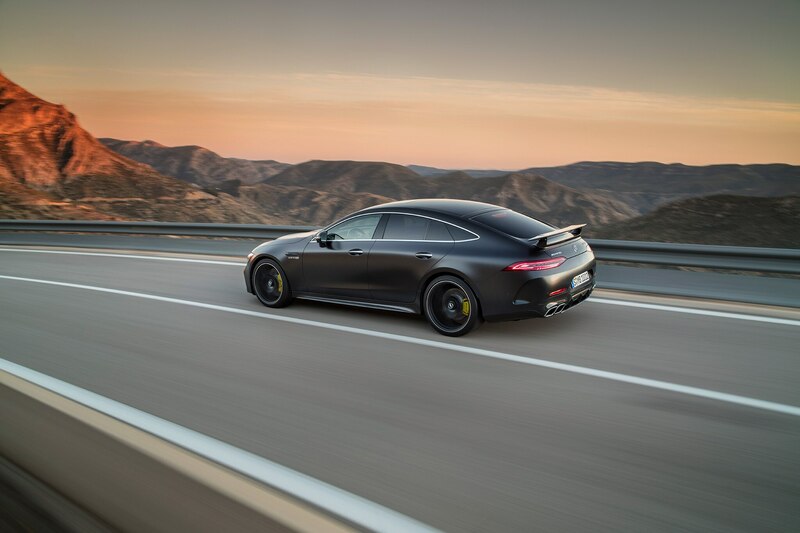 On-demand AWD with four-wheel torque vectoring is part of the package for all, as are variable-rate power-steering, a limited-slip differential, and for the 63 and 63 S only, the increasingly popular rear-wheel steering and available carbon-ceramic brakes. 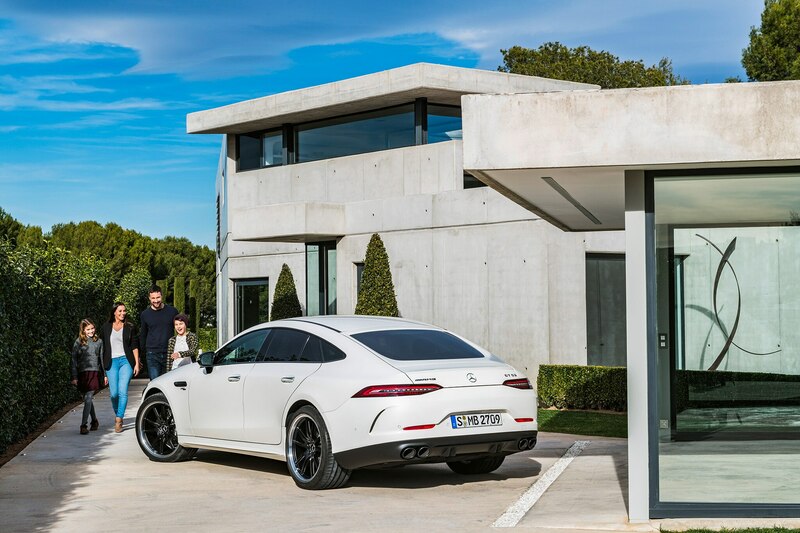 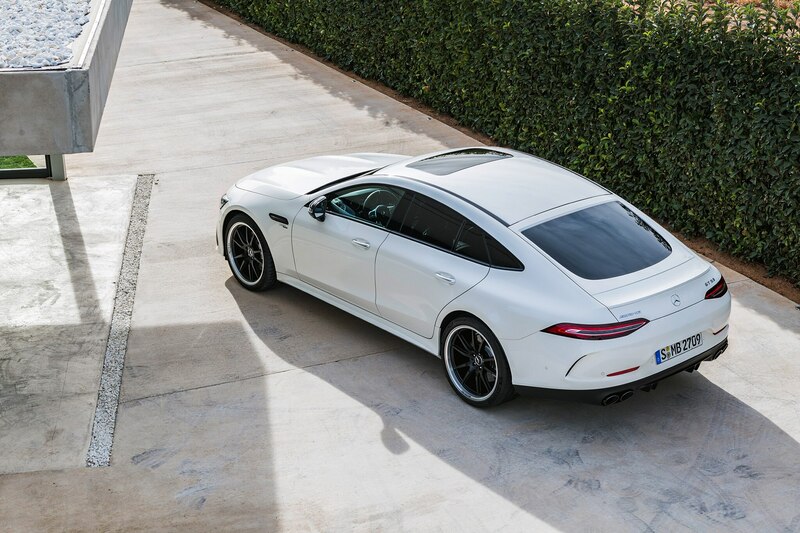 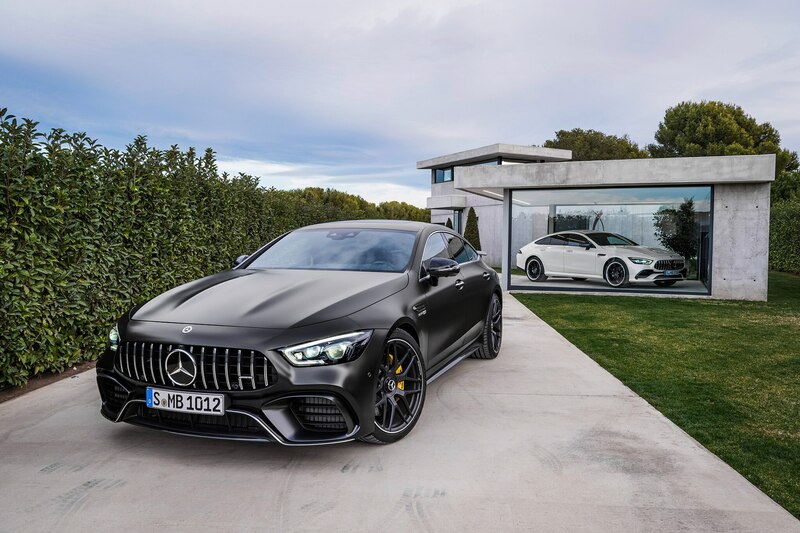 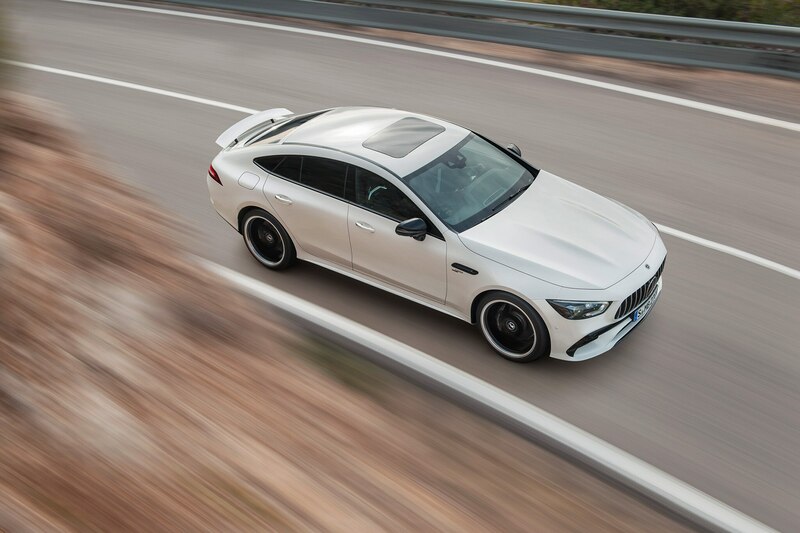 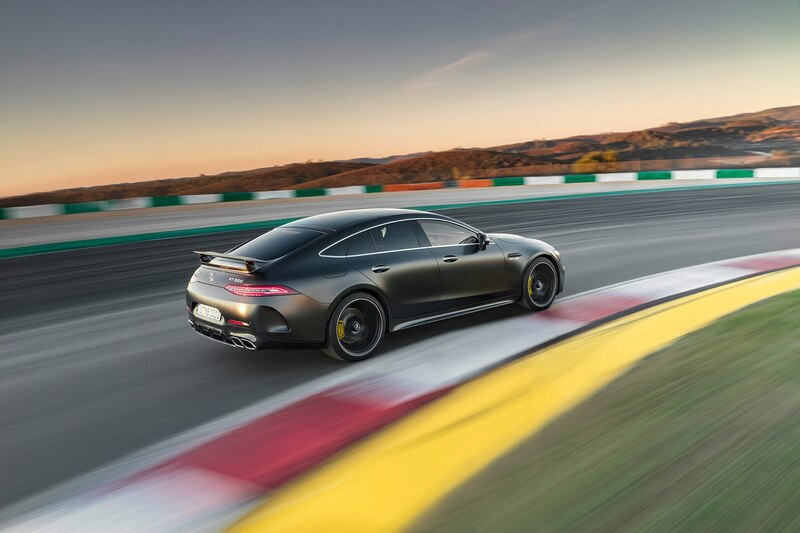 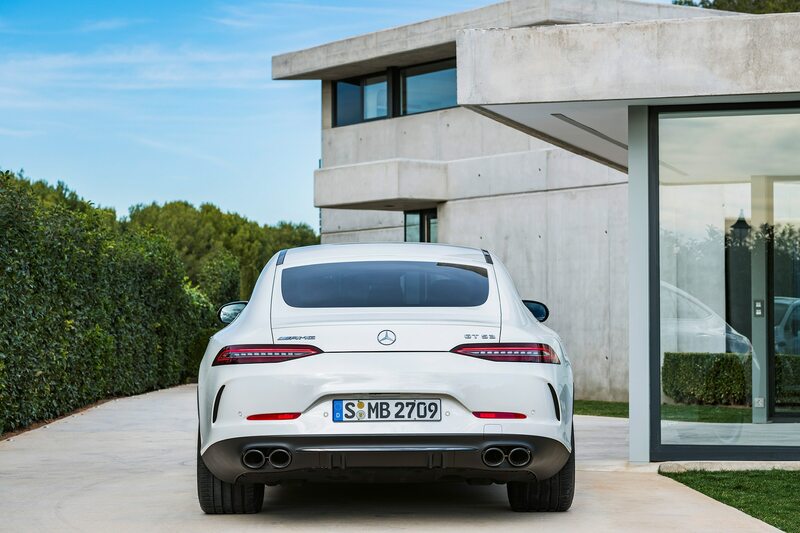 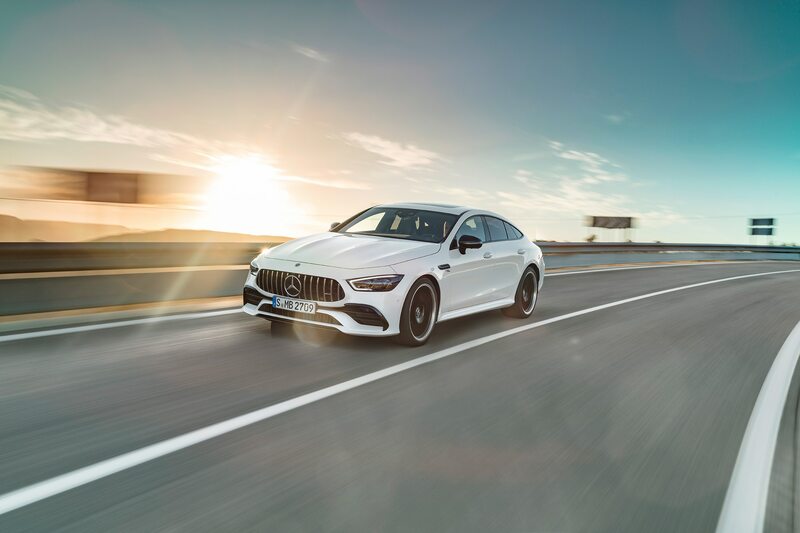 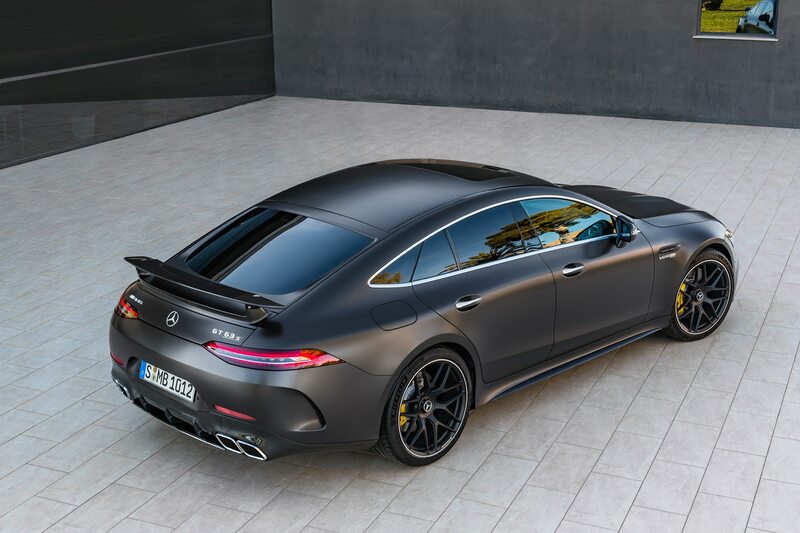 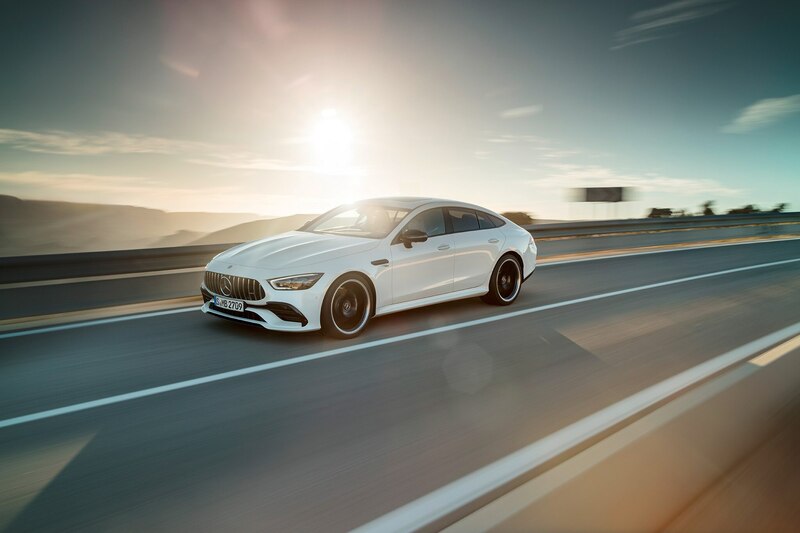 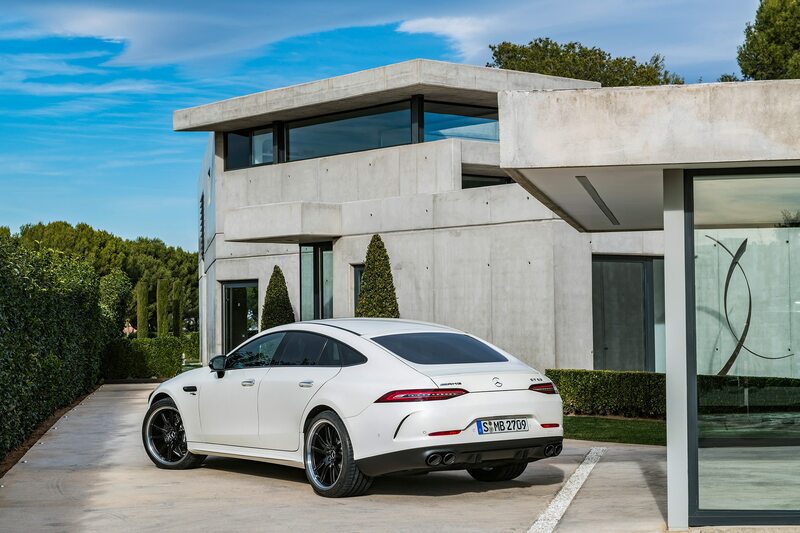 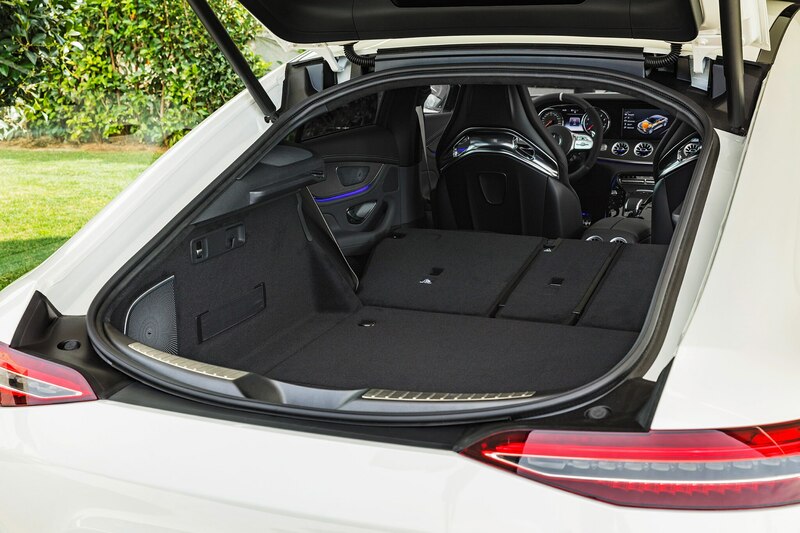 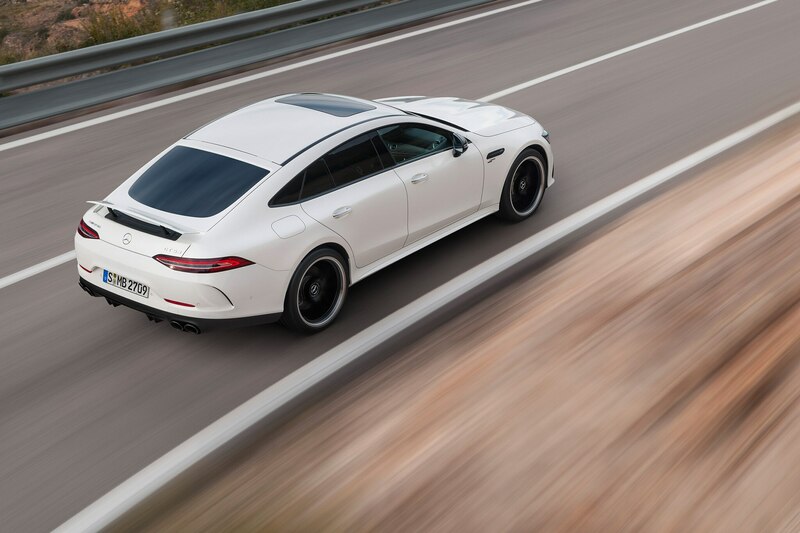 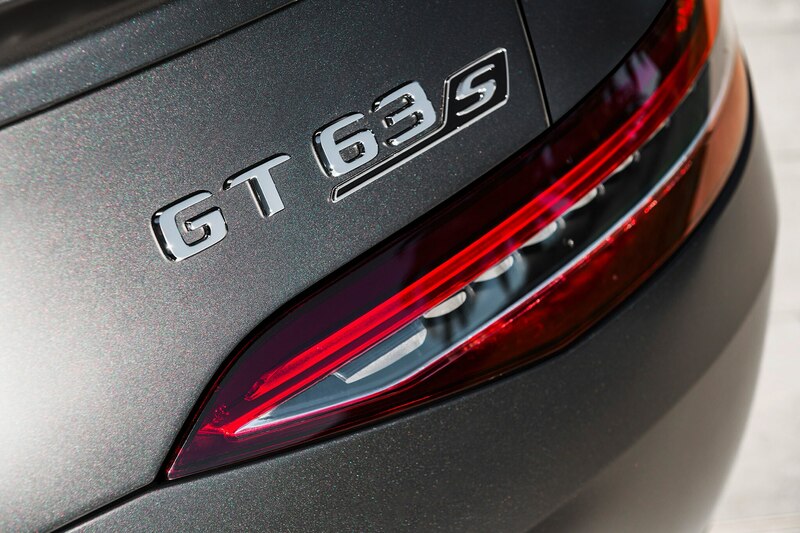 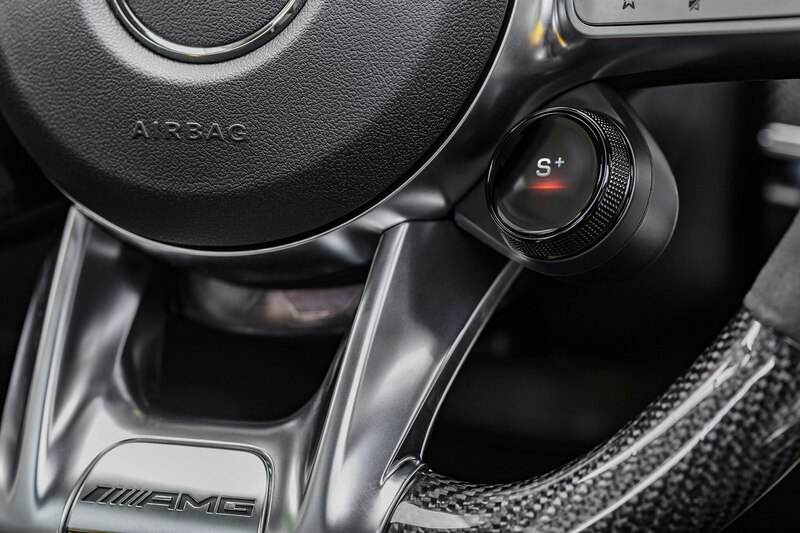 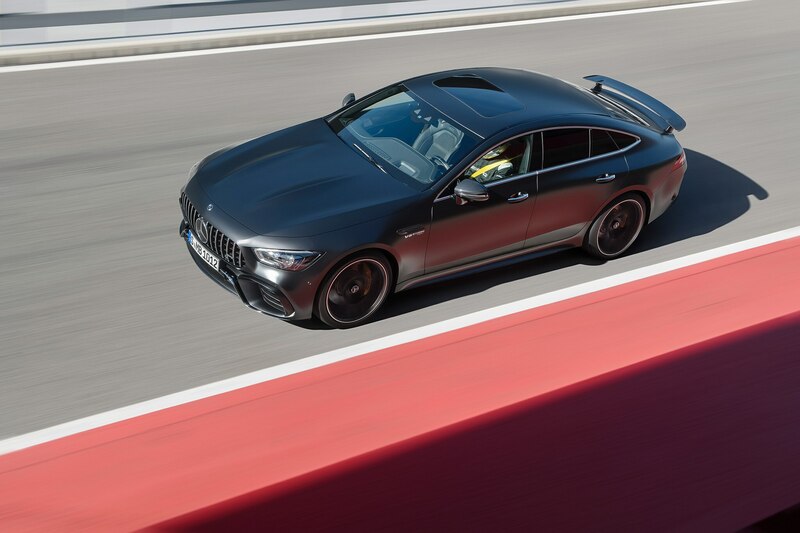 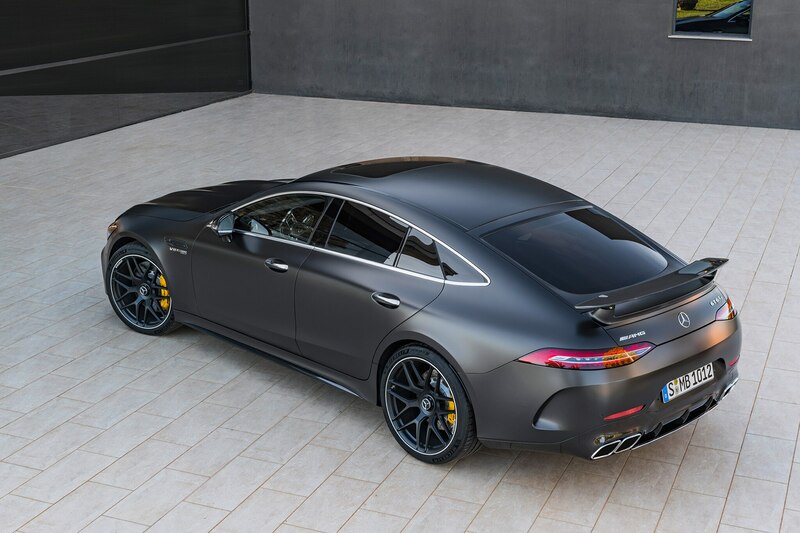 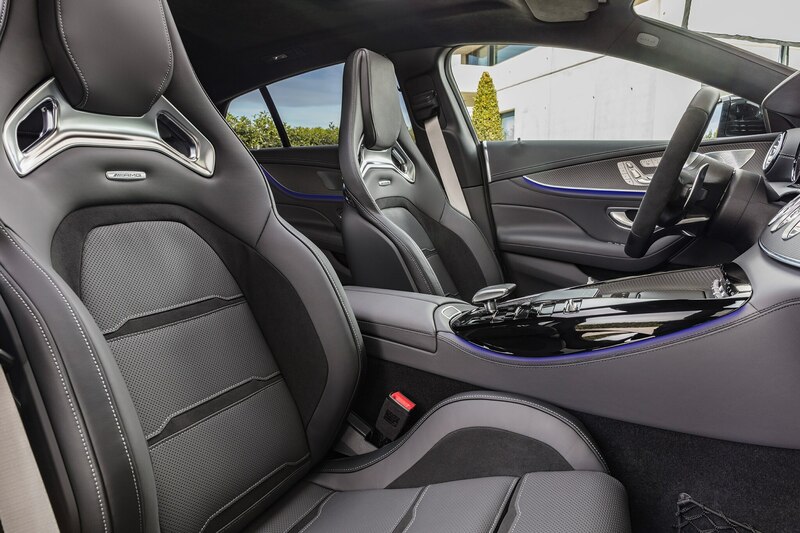 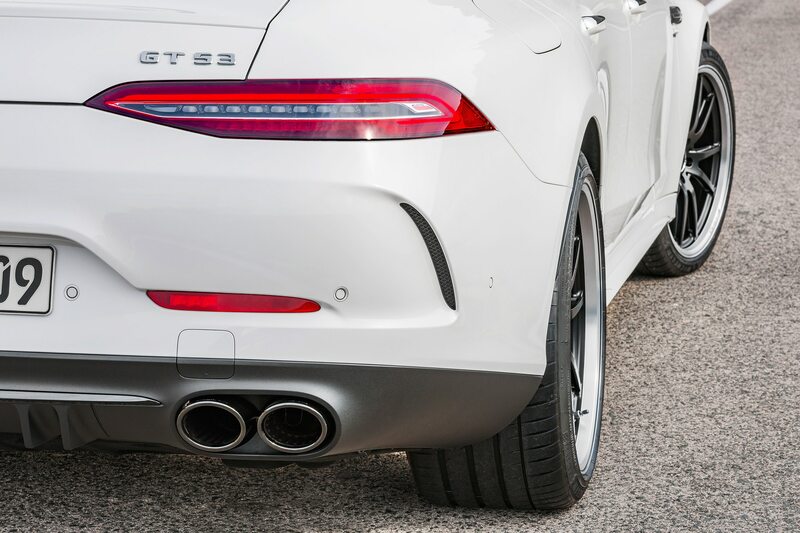 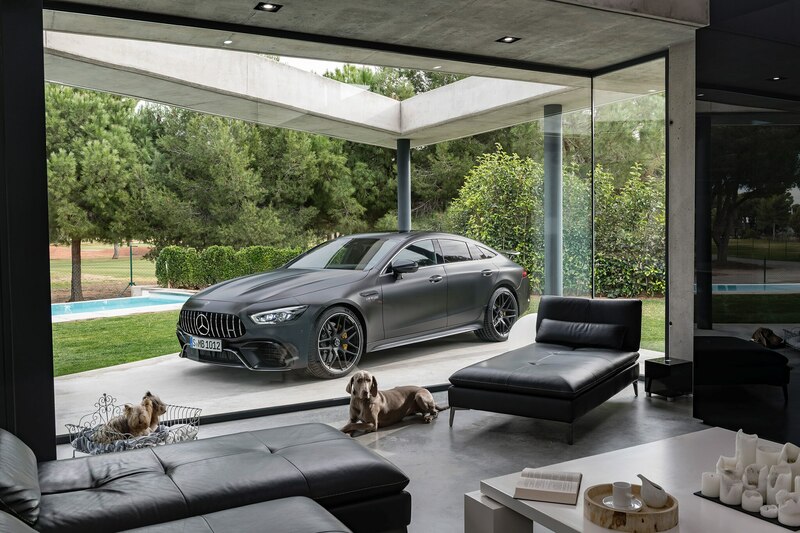 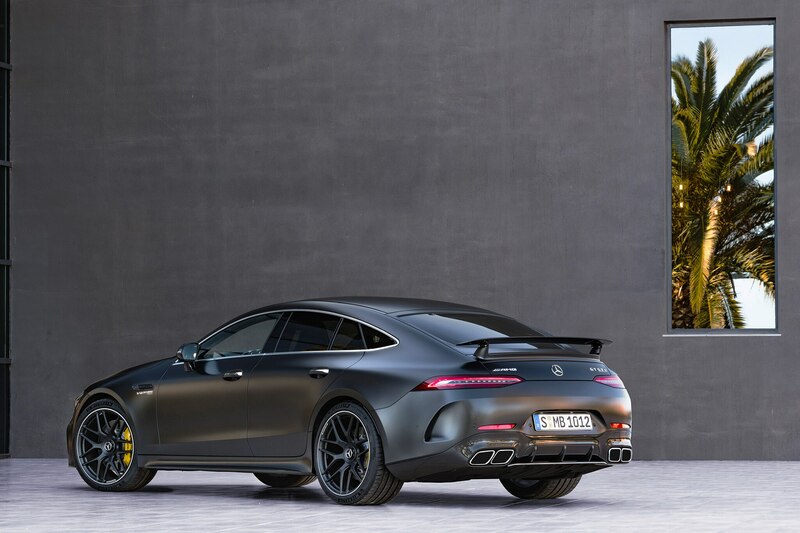 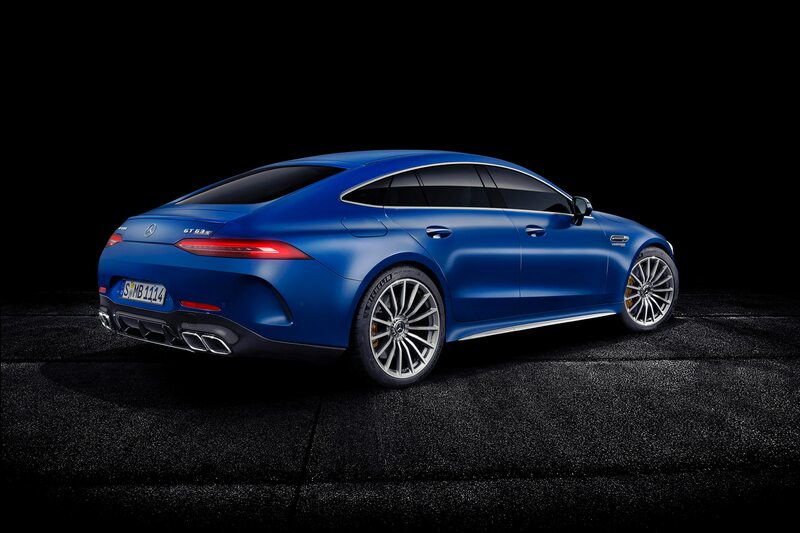 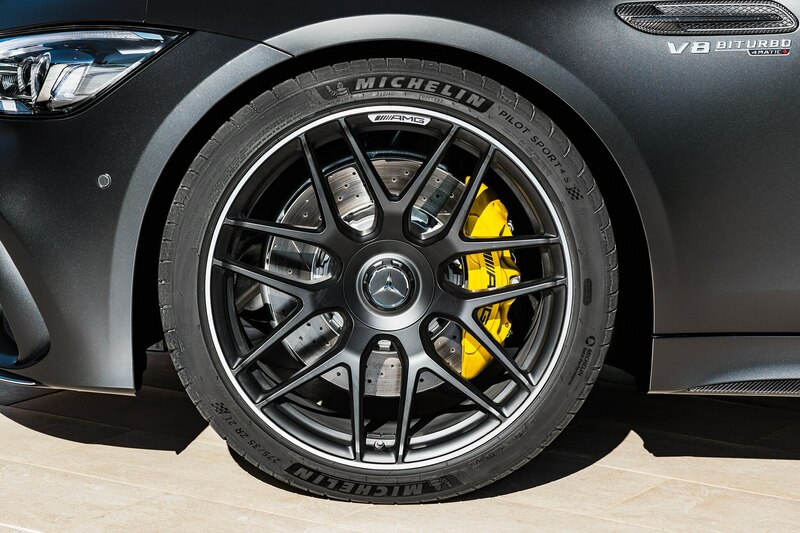 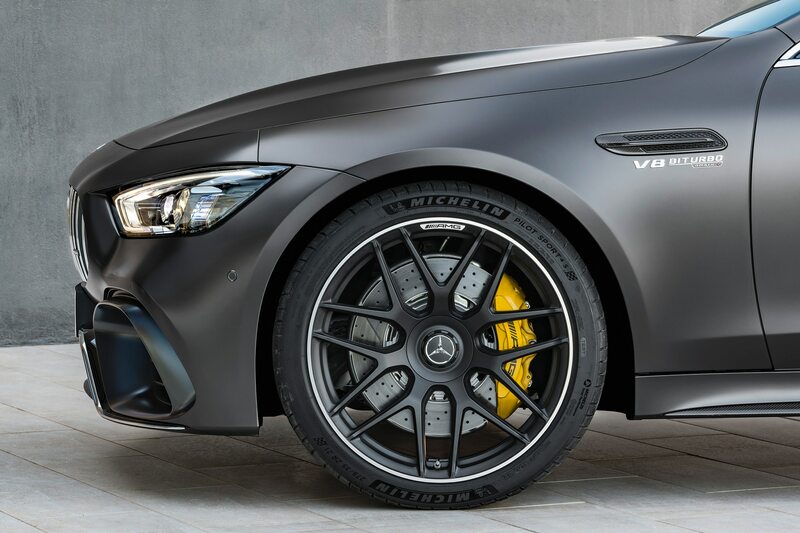 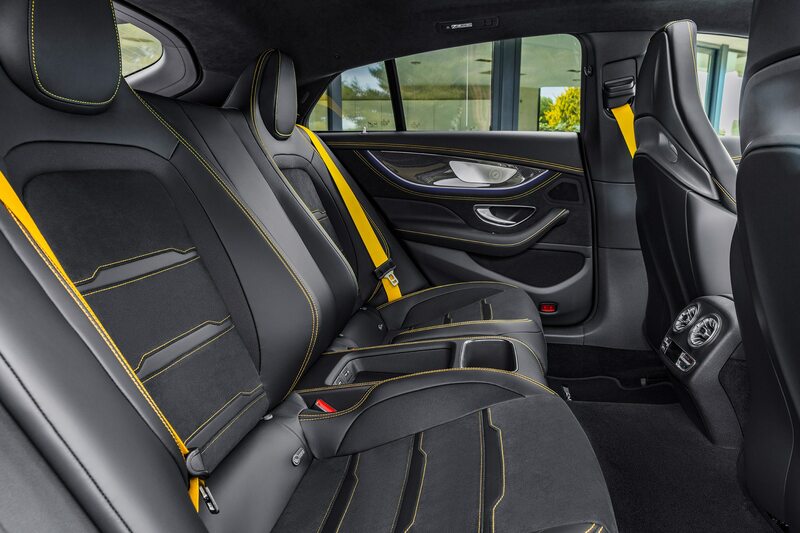 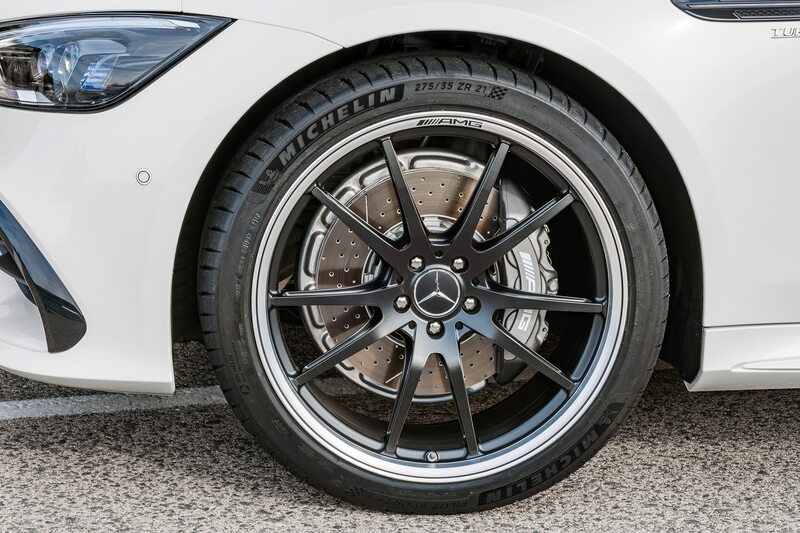 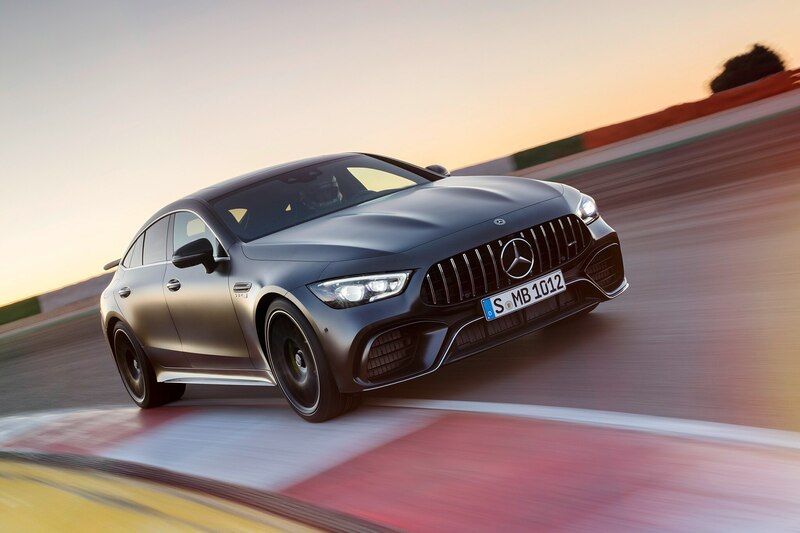 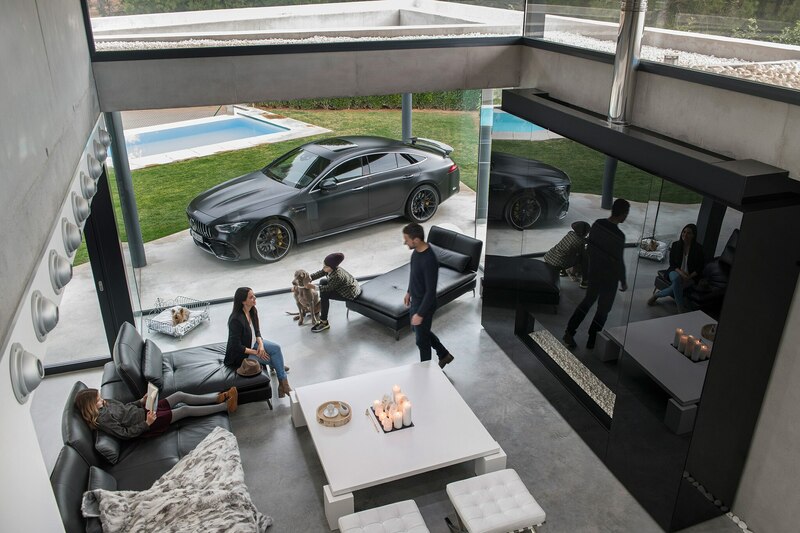 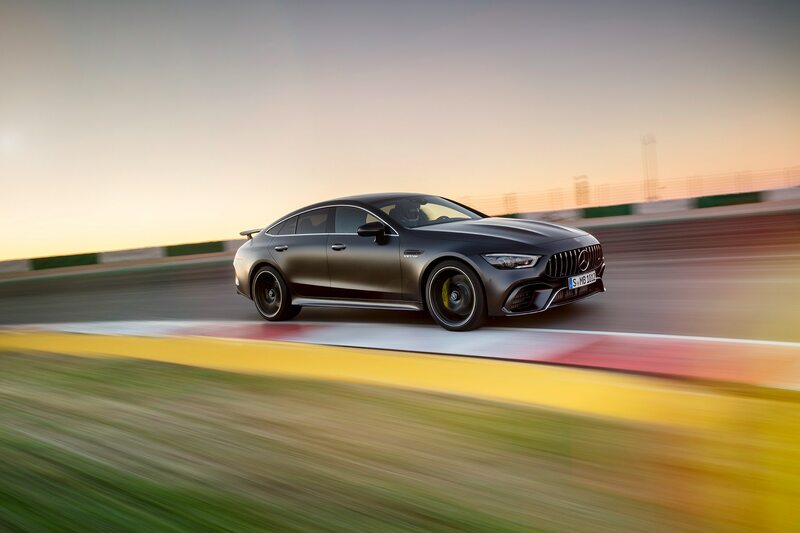 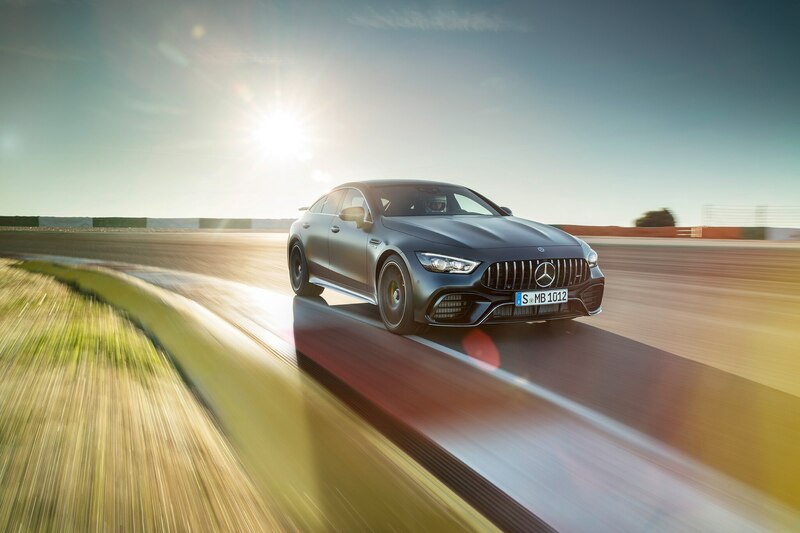 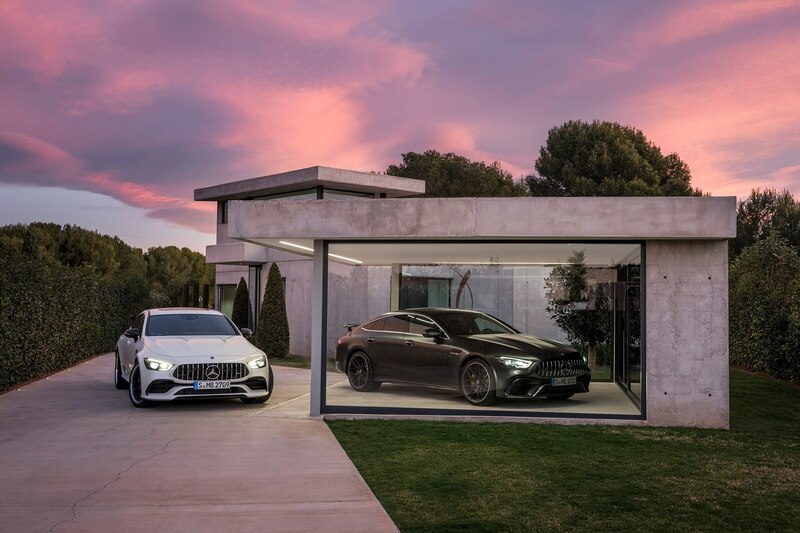 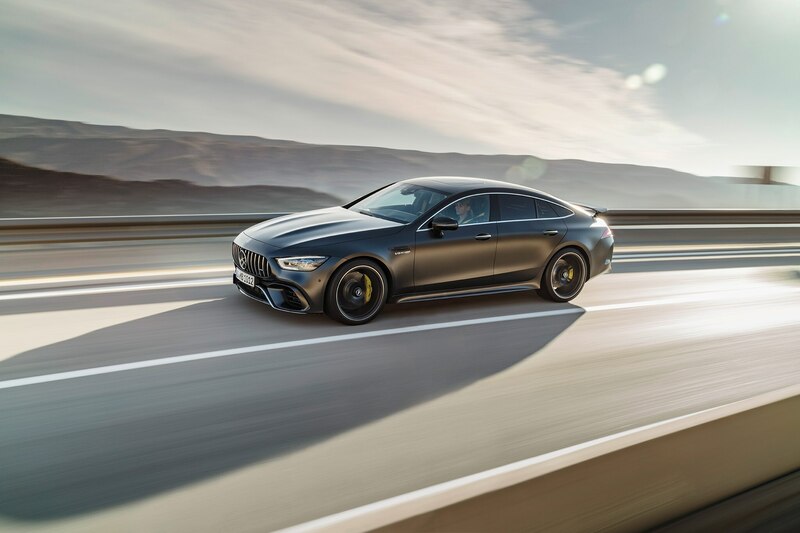 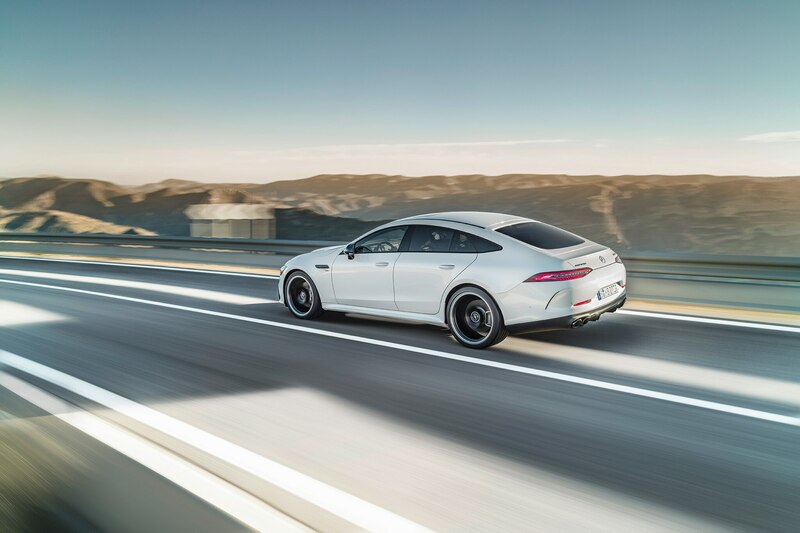 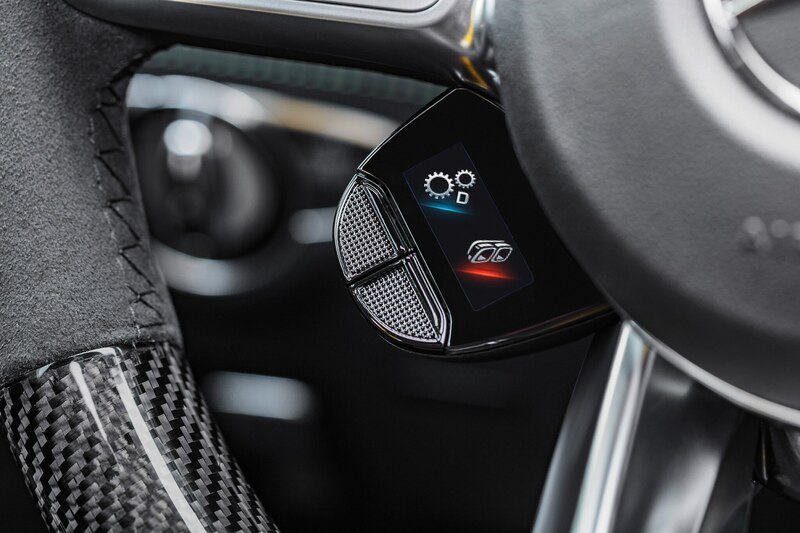 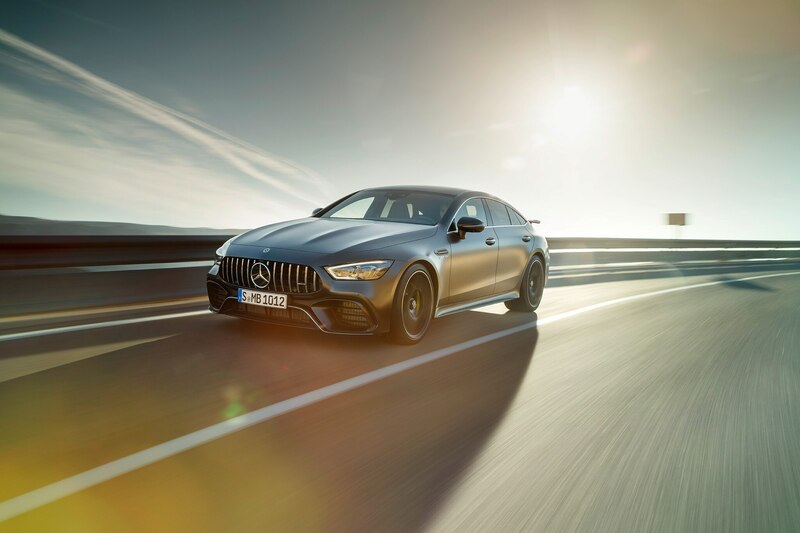 The AMG GT 63 and 63 S also employ an adjustable triple-chamber air suspension while the GT 53 makes do with steel springs mated to electronically controlled dampers. 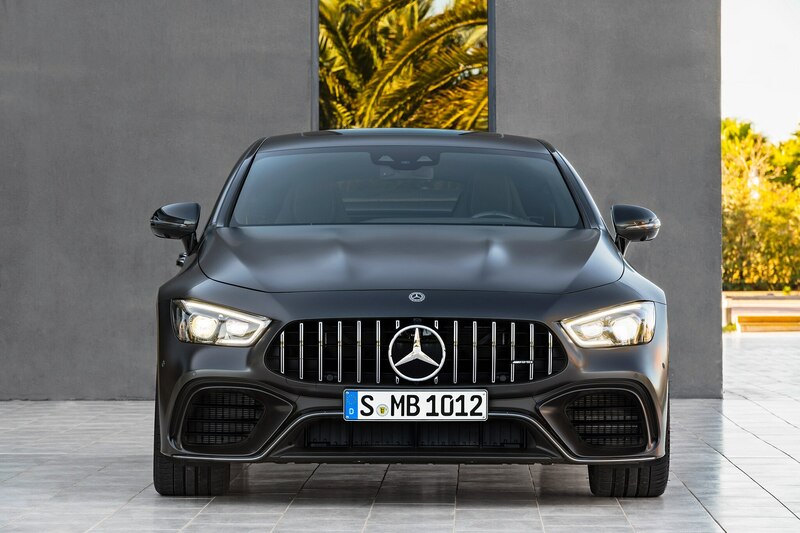 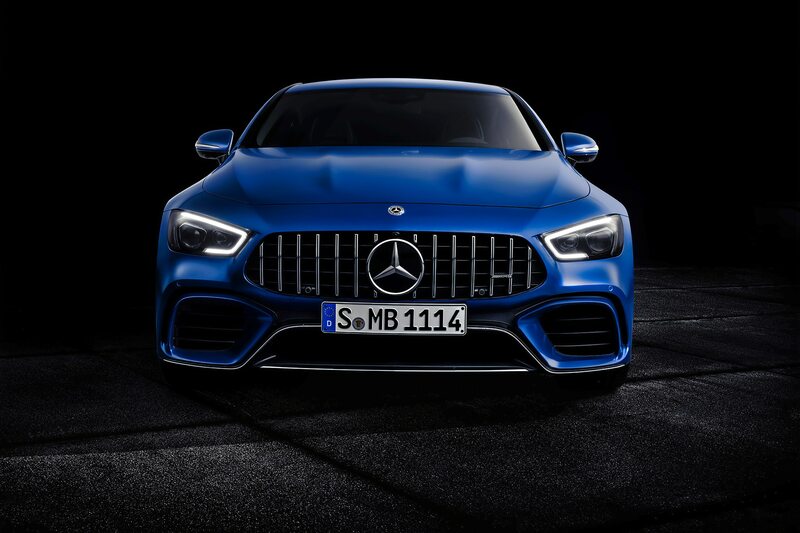 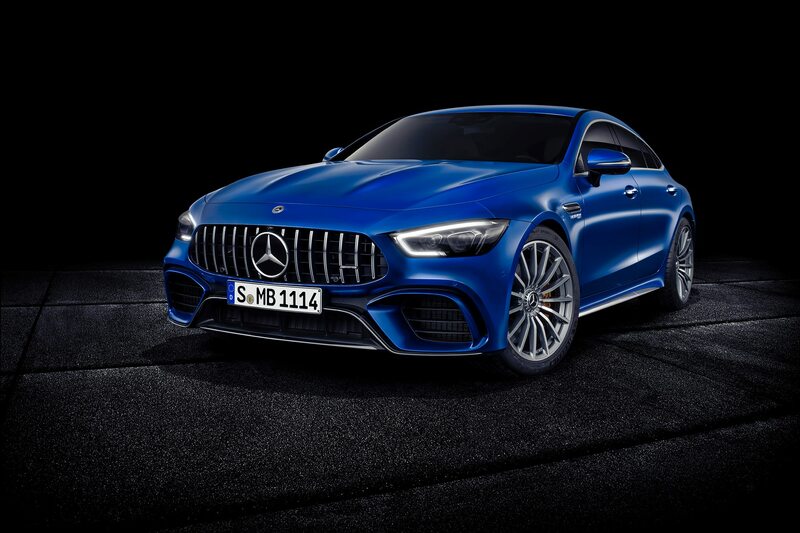 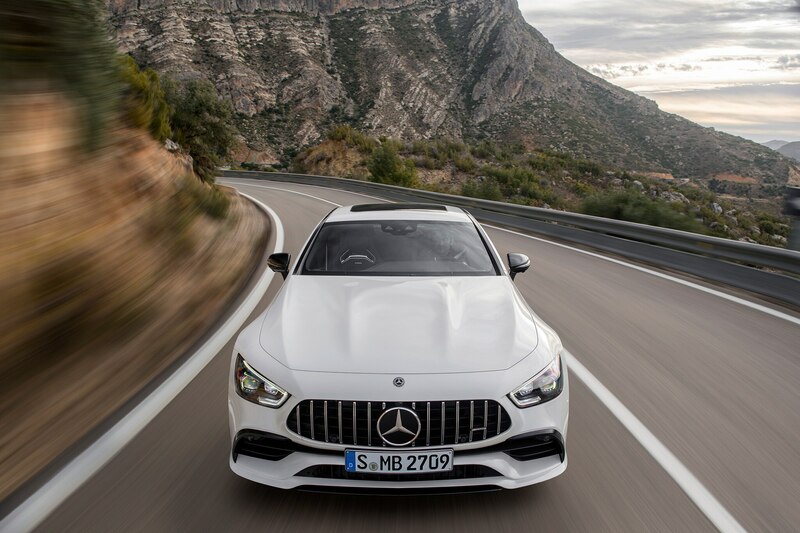 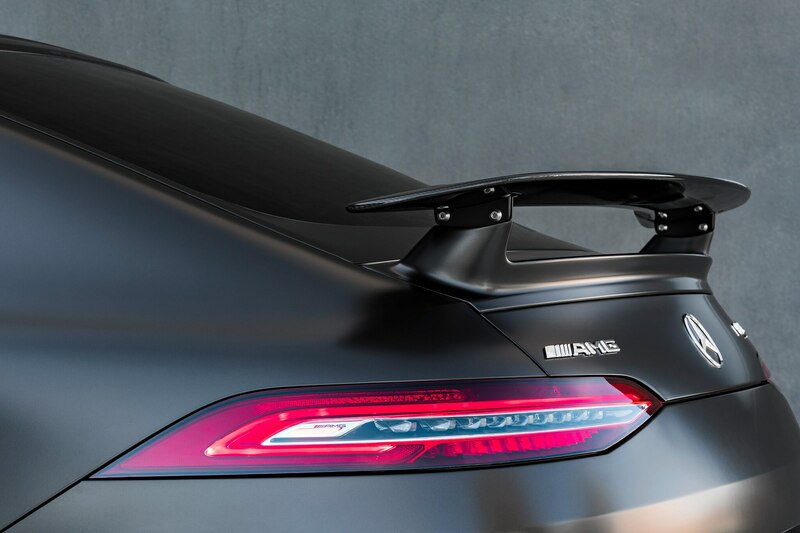 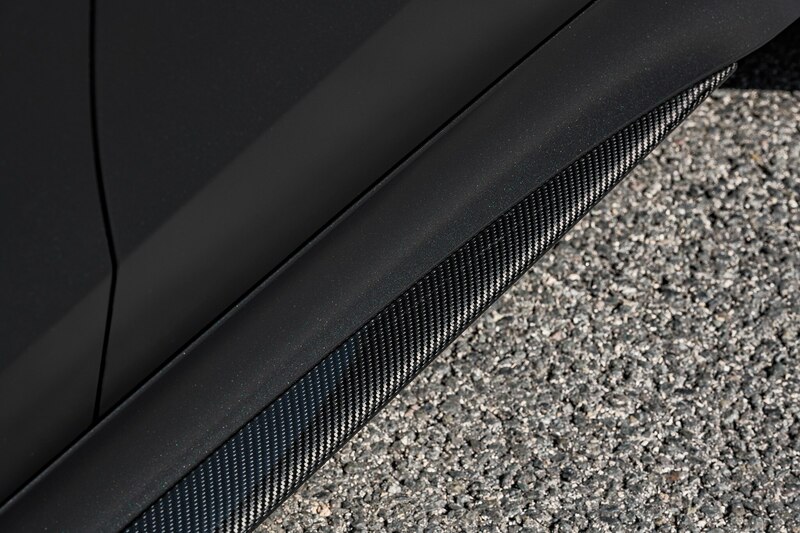 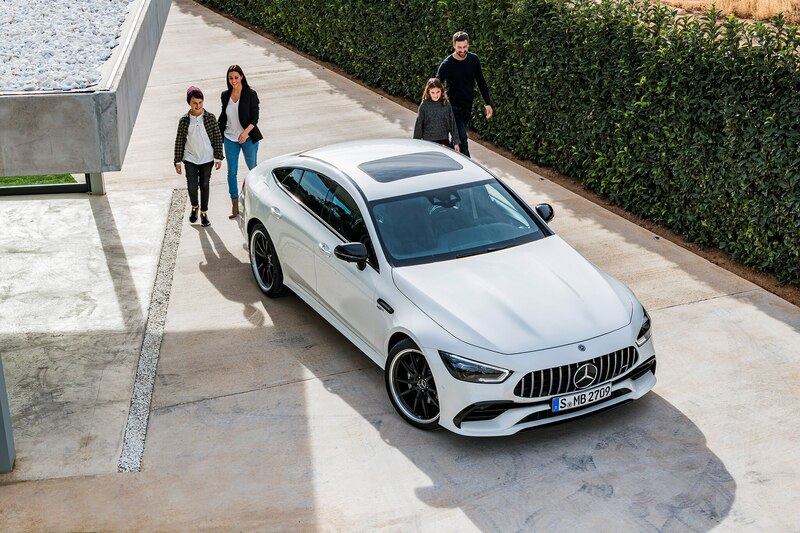 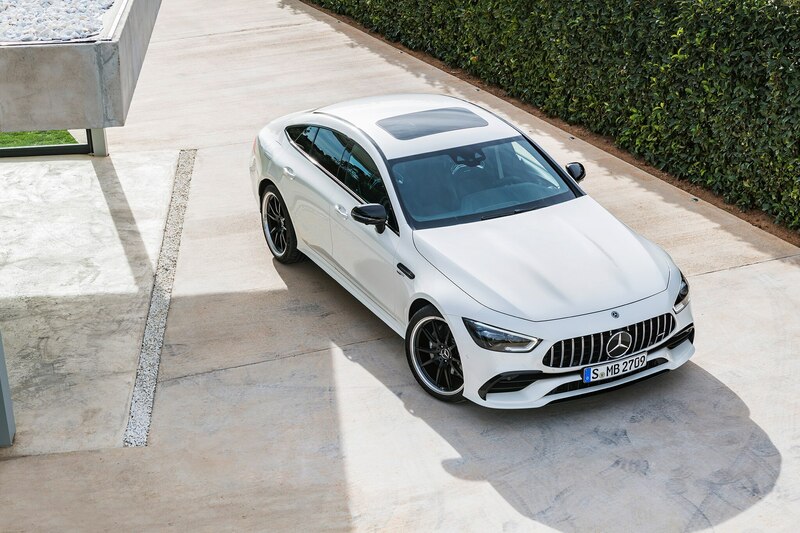 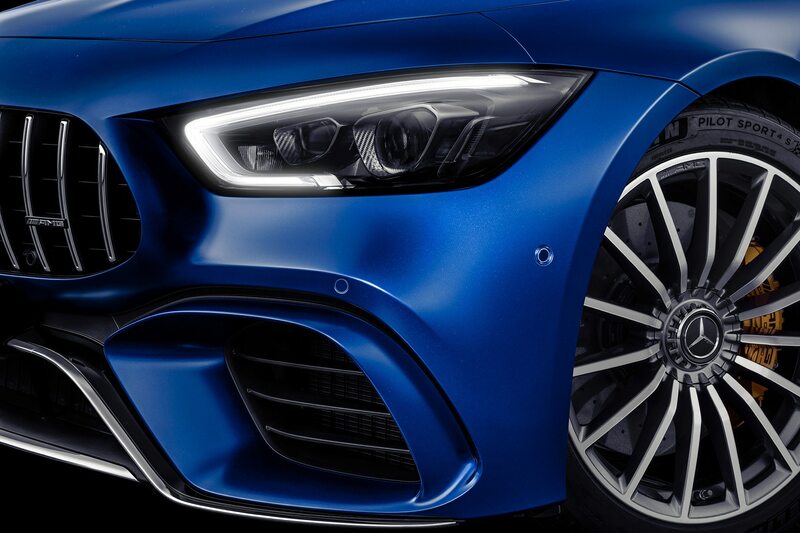 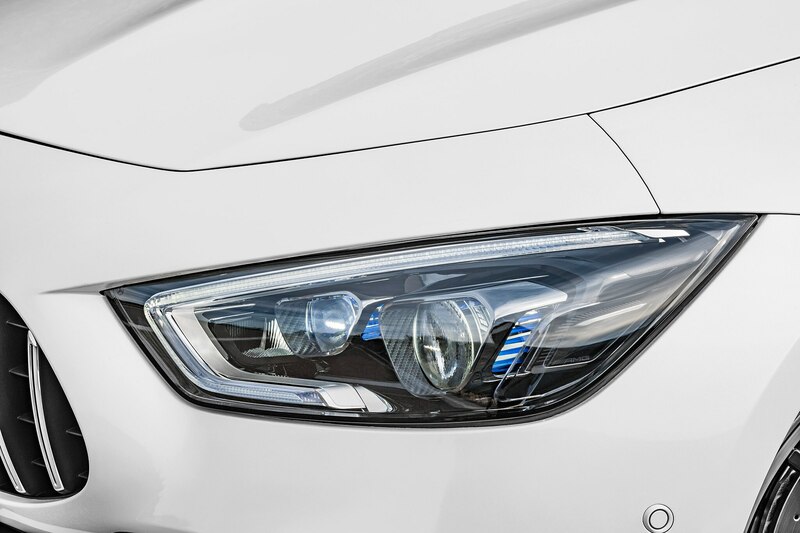 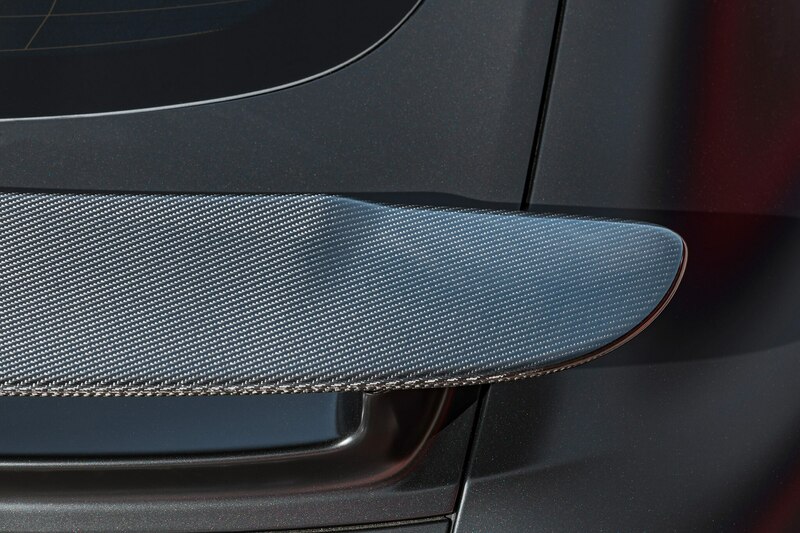 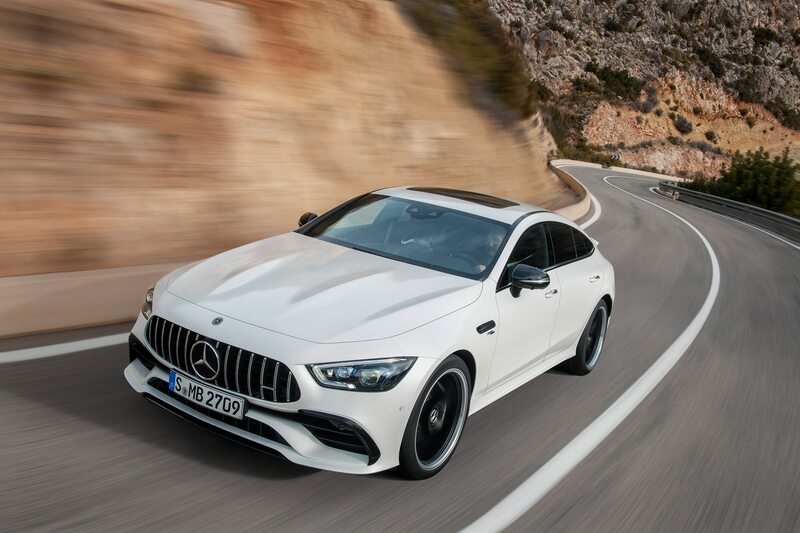 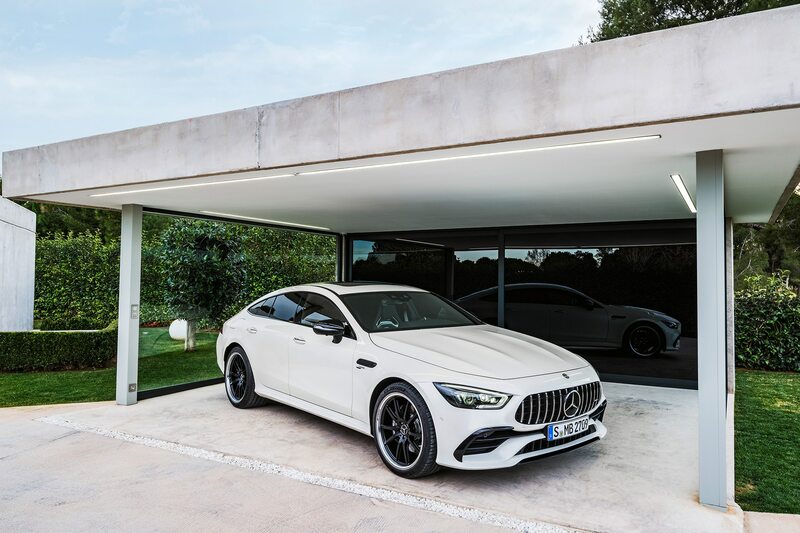 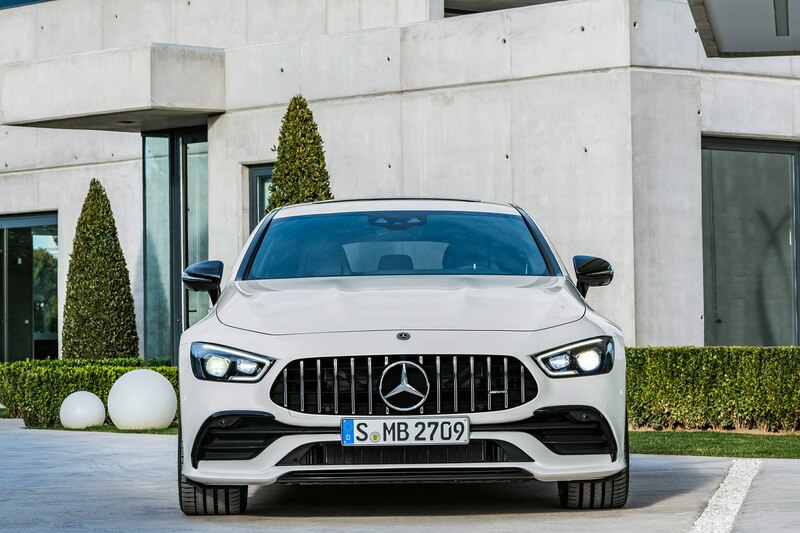 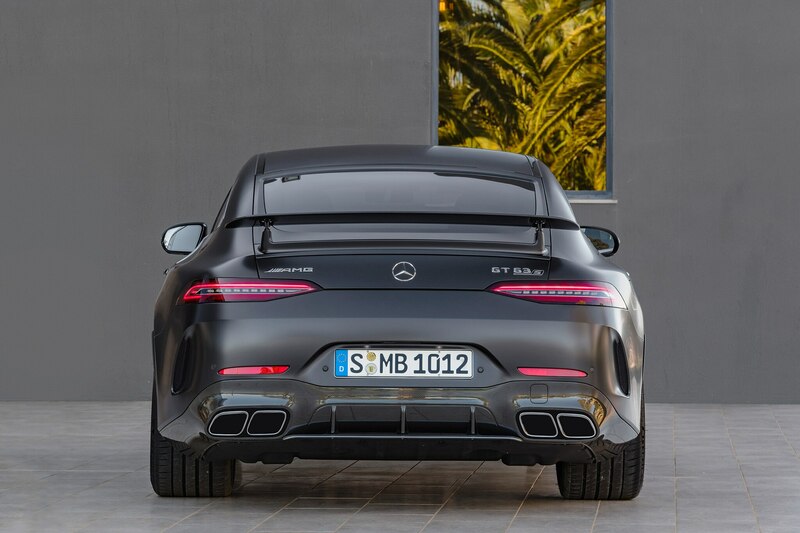 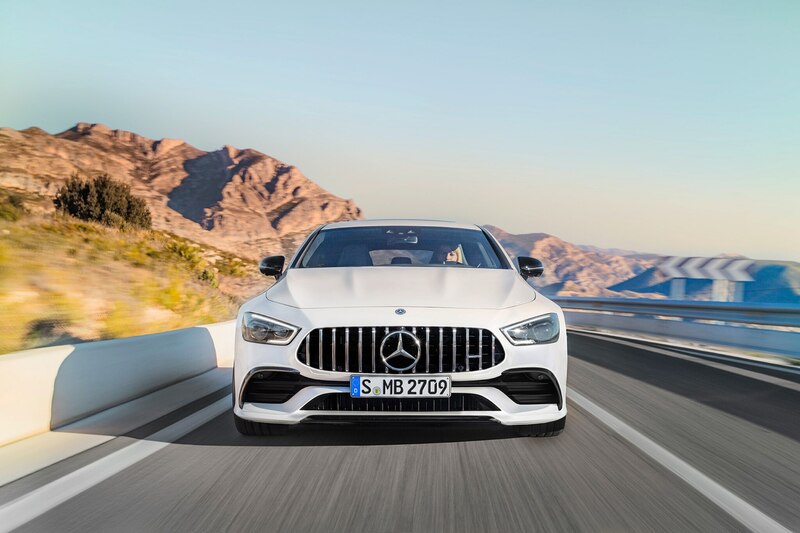 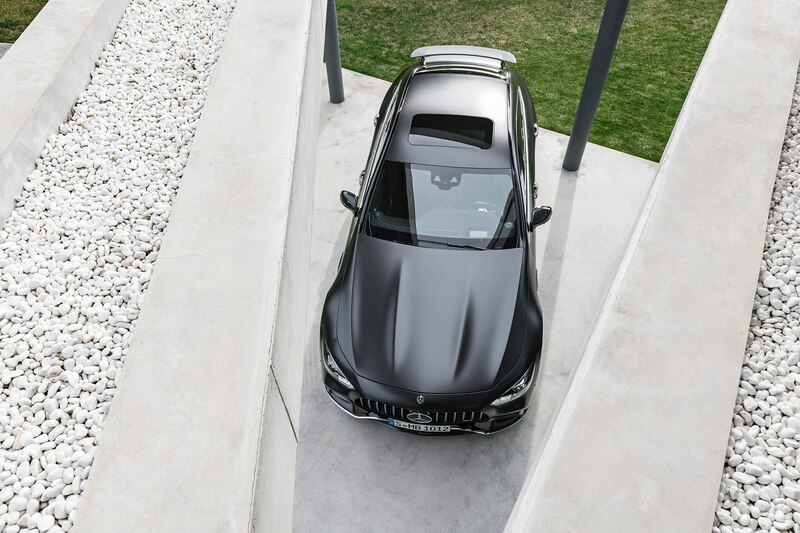 Beyond the grille, the AMG GT 4-Door Coupe also fields an adjustable air panel in the low-flying front bumper, a multi-stage pop-up rear spoiler and a prominent rear diffuser, as well as fully functional air curtains for the front wheels. 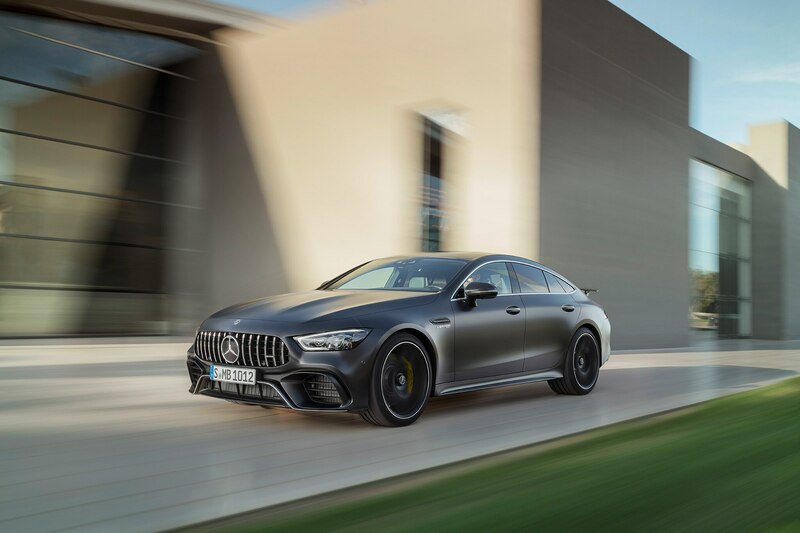 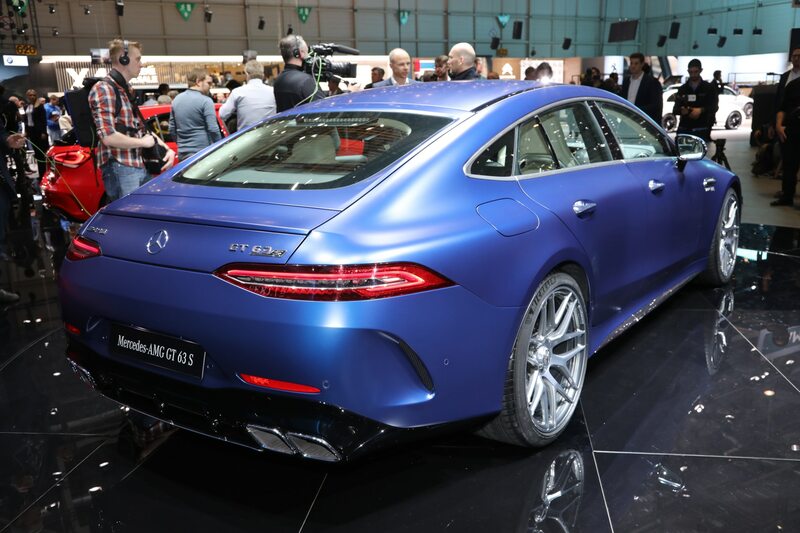 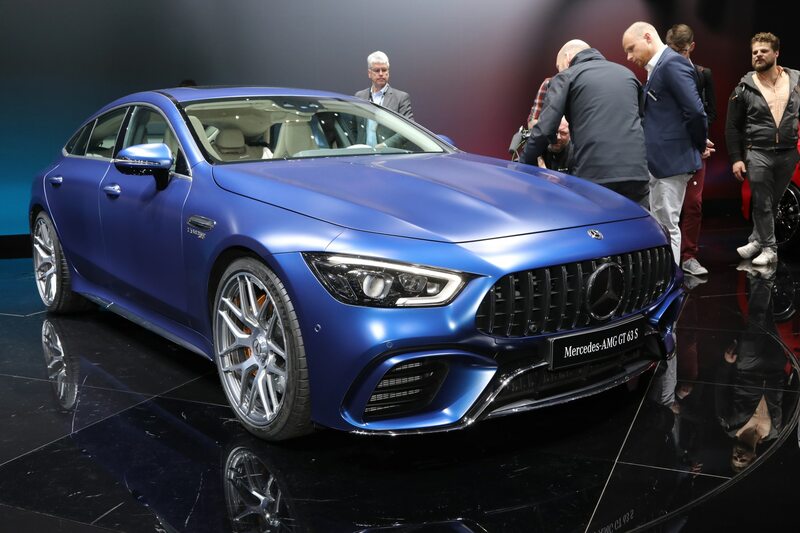 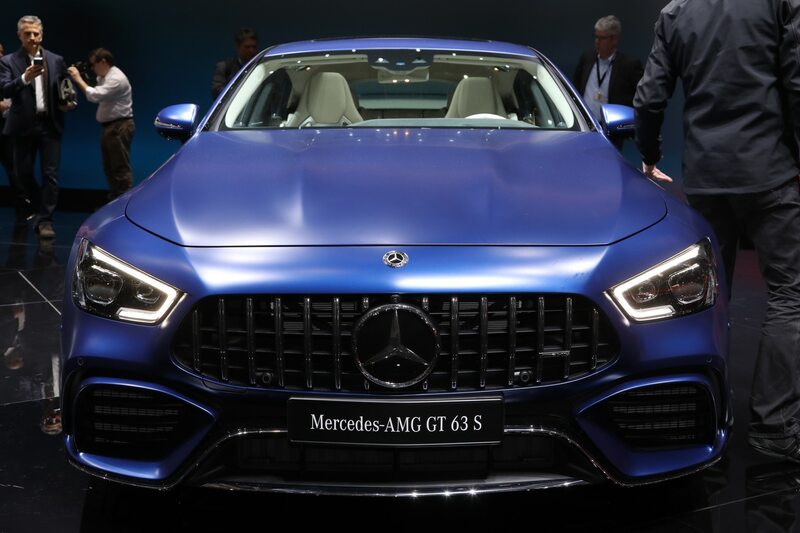 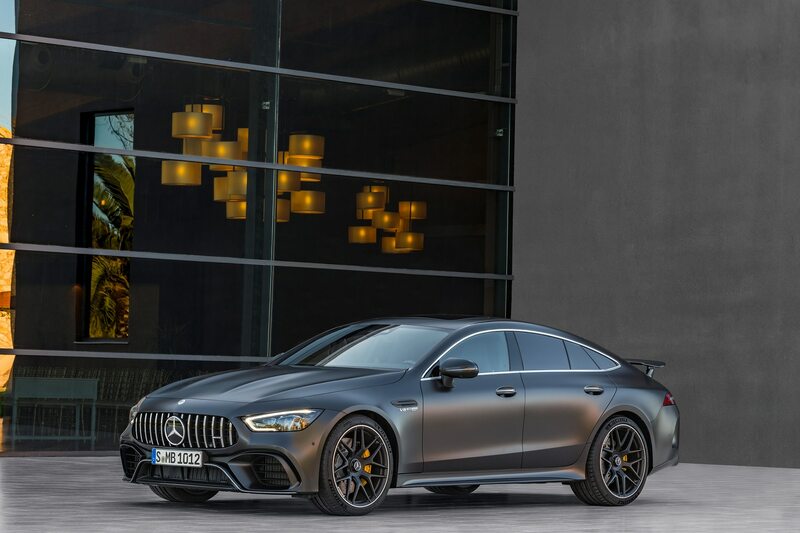 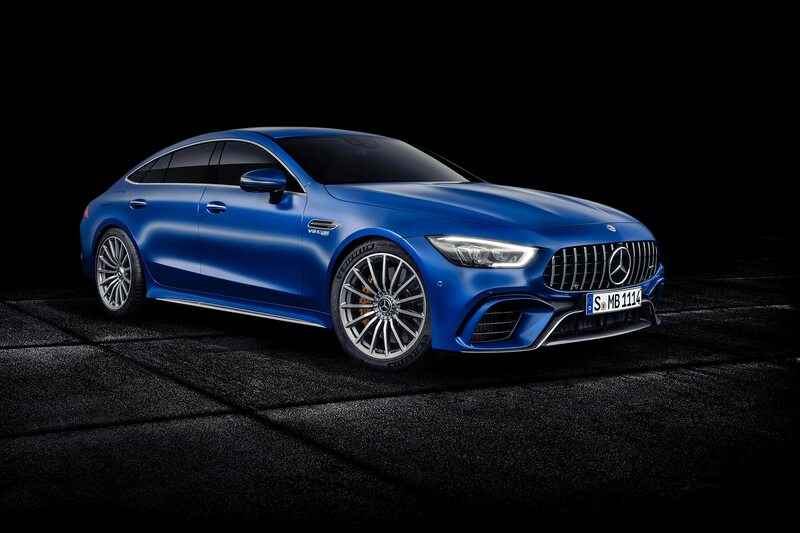 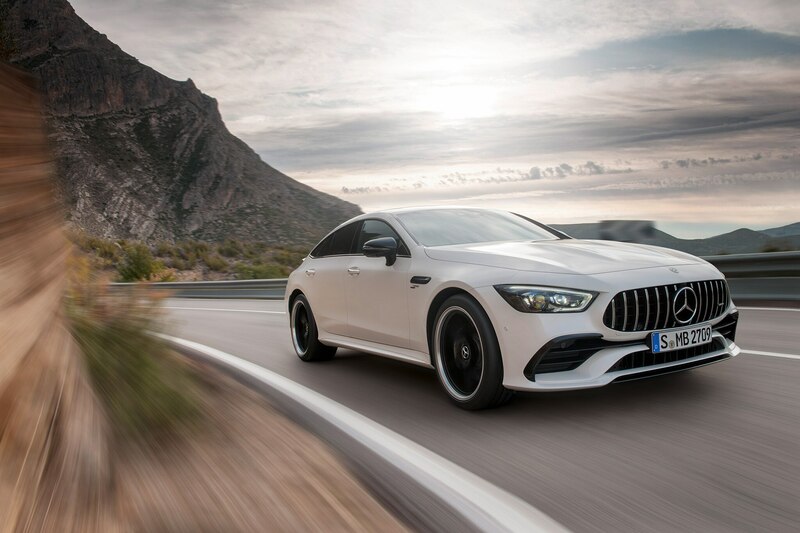 The 20219 AMG GT 4-Door Coupe will be more expensive than the 2019 CLS-Class, which in turn will cost about $10,000 more than the E-Class, so figure around $100,000 for the AMG GT 53, $125,000 for the AMG GT 63 S, and somewhere in the middle for the GT 63. 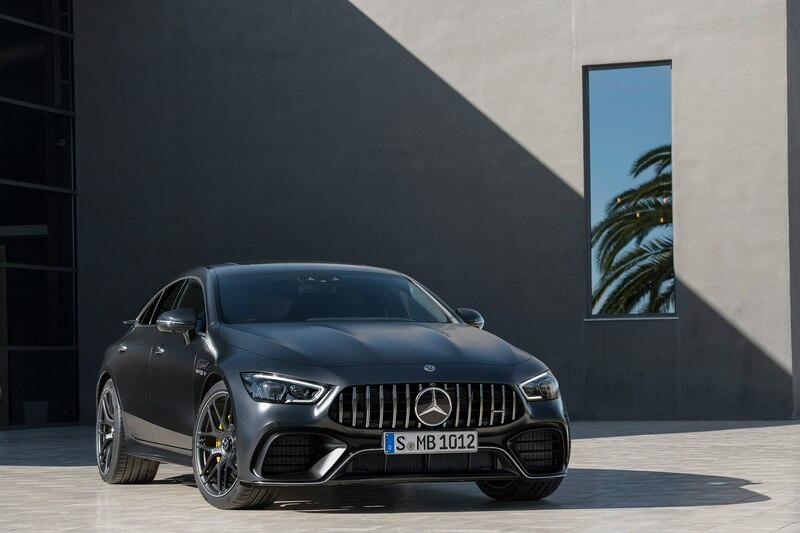 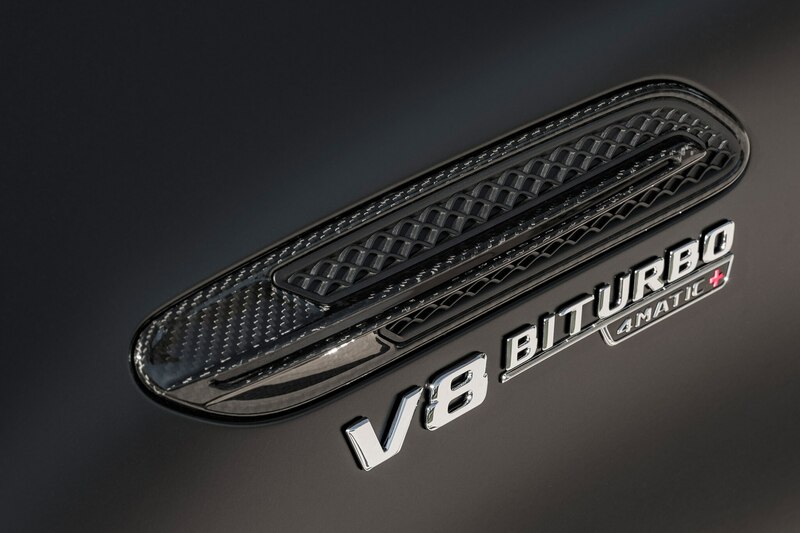 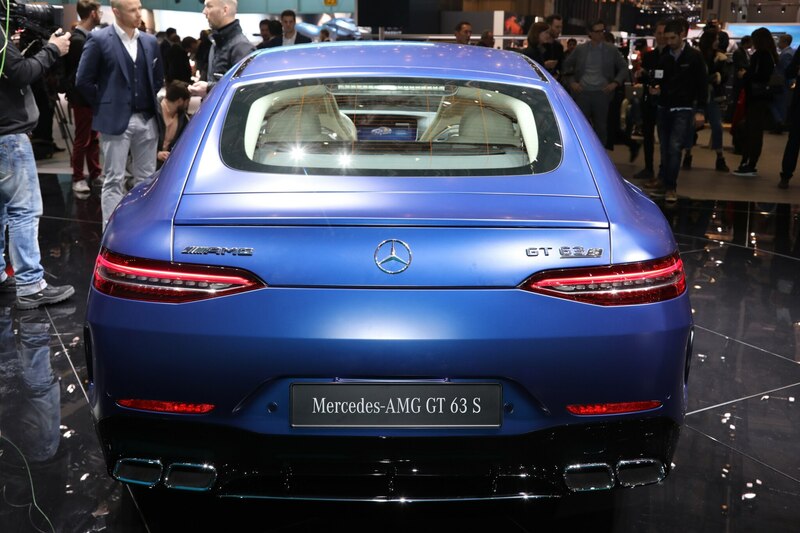 The V-8 variants arrive in the U.S. in early 2019 (GT 63 / GT 63 S), mid-2019 for the AMG GT 53.